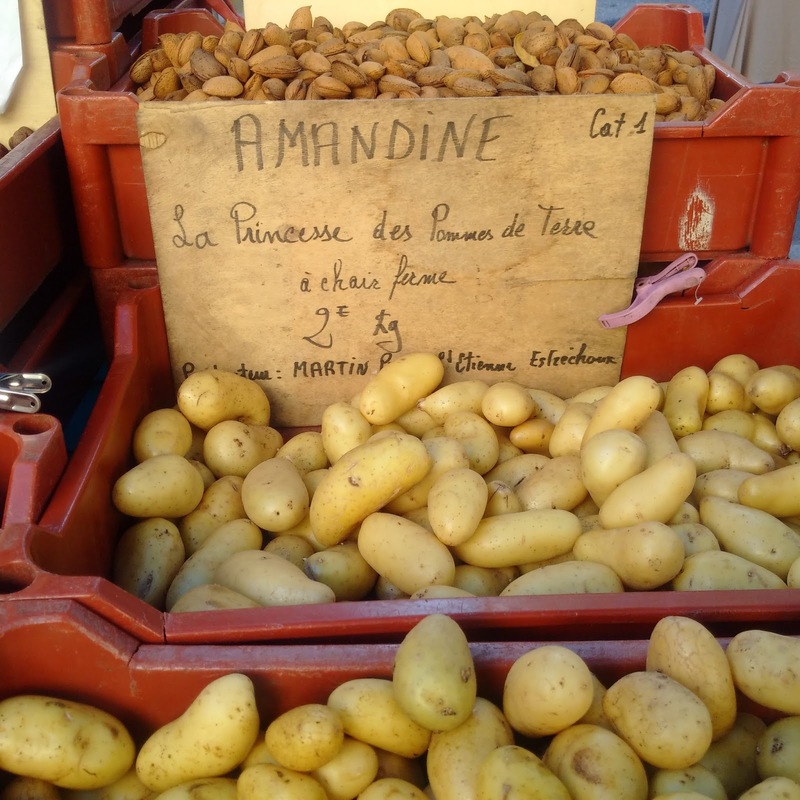 When we came back from our trip to France two weeks ago, along with the copper kugelhopf tins, bottles of olive oil and plaits of pink garlic, I stuffed into my luggage a plastic bag filled with walnuts – a gift from the man at the brocante from whom I’d bought the cake tins. They’ve been sitting in a bowl in the kitchen ever since, a nutcracker poised hopefully on top. I’ve made the odd crack-and-grab raid, snatching one or two as I walk past, or nibbled a few after dinner with some cheese. But I have been longing to make a cake. 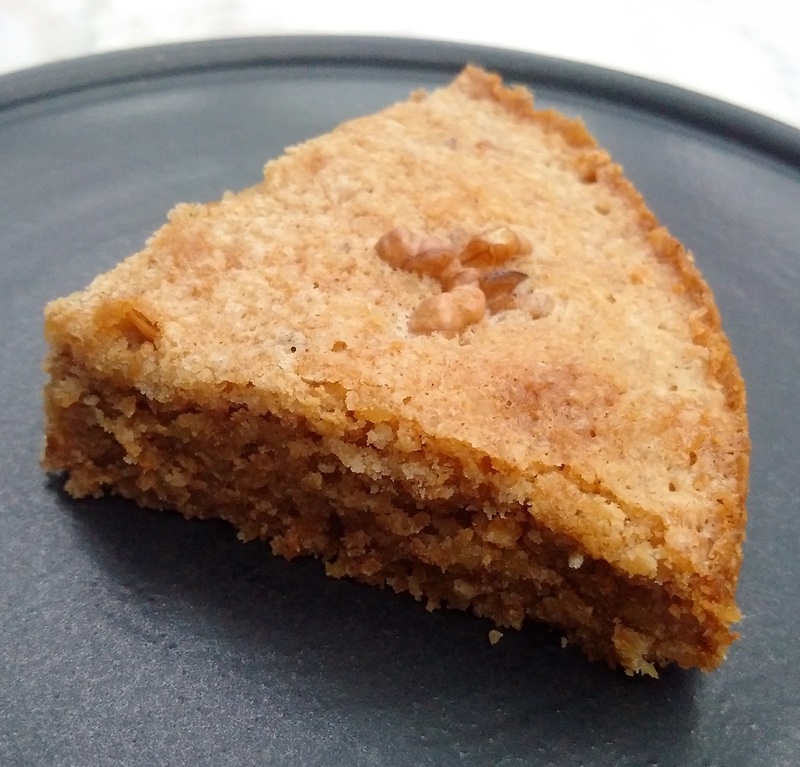 Not a classic coffee and walnut cake – though I love that – but a very simple thing. I wanted a low, plain cake, one that would allow the creamy lusciousness of the fresh walnuts to shine – at least enough to make the shelling of them worth it. So on Saturday, I sat in my kitchen, rhythmically shelling 500g or so of walnuts, sending shards of shell onto high shelves and skittering across the floor, much to the excitement of the cat. As I cracked, and picked and extracted the meat from the nuts, I watched the news from Paris on the television. I have loved France, the fantasy of it and the complicated reality of it, ever since I first visited Paris with my school when I was 10. I sit here typing and deleting, typing and deleting, finding it impossible to convey my deep affection for a country which has helped form me almost as much as the one that birthed me. What Ian McEwen had to say here expresses it. And this much-shared segment from John Oliver’s Last Week Tonight on HBO… well, I was just cheering my head off at this. 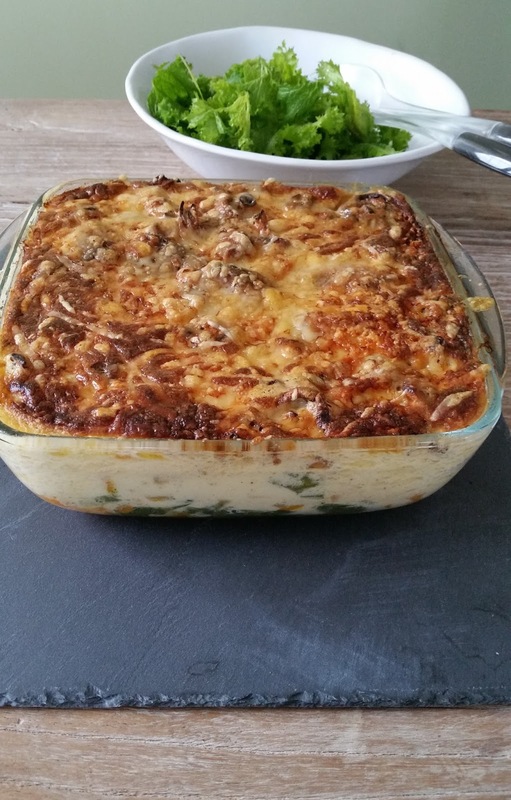 I took my inspiration from this recipe from the very useful site of the French food magazine Marmiton. I love it. I hope you do too. I tried serving it in several ways. With poached quince and quince ice cream after Sunday lunch, with cream and then with thick Turkish yoghurt, but really it’s best with nothing at all, just by itself, with perhaps a glass of sweet wine or rum to sip along with it. Preheat the oven to 180°C/160°C Fan/Gas 4.Lightly butter the bottom and sides of a loose-bottomed 21cm cake tin. Line the base with parchment and butter the parchment. Reserve 8-10 perfect walnut halves to finish the cake – if you like, leave them off if you think this is just far too much adornment. Put the rest of the walnuts into a food processor and pulse until most of the mixture is quite fine (you still want a few small chunks in it). Tip a third of the sugar into the processor and pulse once to blend. It should have the texture of slightly gritty sand. Of course, you can chop the nuts finely on a chopping board with a large knife if you like. Beat together the butter and remaining sugar until light and fluffy. Beat in the walnut mixture, then add the eggs one at a time, mixing well after each addition. Stir in the rum then gently fold in the flour and salt until just combined. Spoon the mixture into the prepared tin and arrange the walnut halves on top. Bake for 25-30 minutes, until a toothpick inserted into the middle of the cake comes out clean. It should be lightly golden on the surface but don’t overbake it – you want it to remain soft in the middle. Place the tin on a rack and leave the cake to cool completely before removing it. It keeps quite well for a few days in an airtight container. I love the idea of elevenses. I feel a tremble of sadness that it’s now virtually extinct, but then I still write with a fountain pen and keep a dodo as a pet. The first thing on my To Do list this week was to revive elevenses. The second thing was to have, tantalisingly on Monday at 11am, the first meeting about the food events for next year’s Stoke Newington Literary Festival. 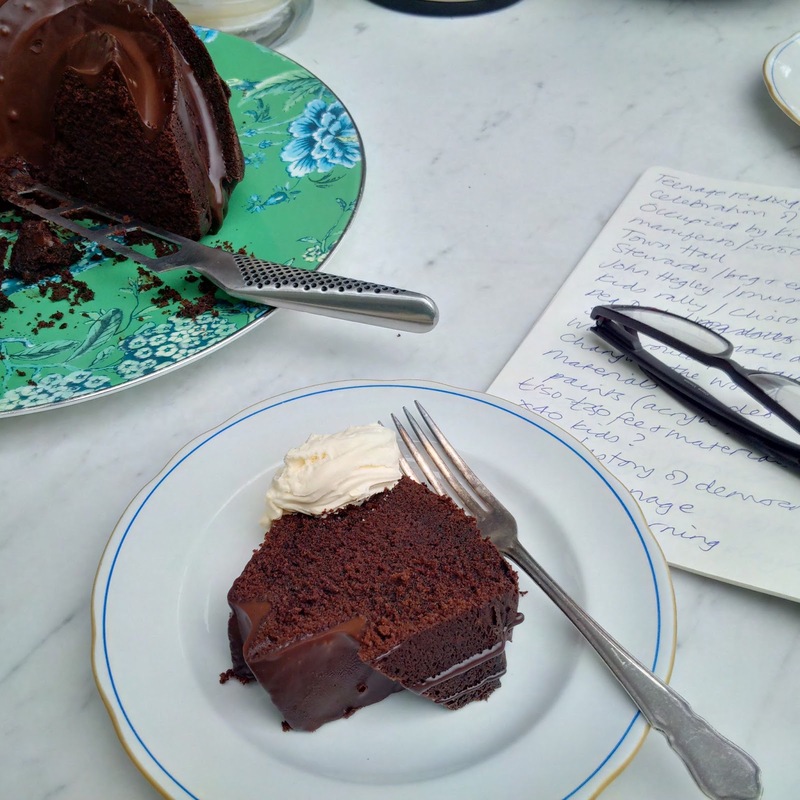 What better reason to bring on the cake than a morning spent talking about books and food, two of my favourite things, with two of my favourite women? Julia, Chattanooga’s finest daughter, is one of my dearest friends and absolutely the sort of person you’d want by your side at the barricades. If your speaker were to arrive late, drunk and naked, she wouldn’t bat an eye. And Liz founded the festival five years ago on a hunch and a credit card. She’s a force of nature whose modesty is matched only by boundless sense of what’s possible. If anyone deserves cake it’s these two. I’m making them founder members and trustees of my Elevenses Revival Society, an arduous responsibility but I think they’re up to it. Inaugural meeting of the Elevenses Revival Society. I used dried morello cherries in this cake because I love them and I throw them into as many things I possibly can, from breakfast porridge to salads and cakes. If you don’t have them or don’t like them, cranberries, raisins or sultanas would also be good. You could substitute brandy or sherry for the kirsch, too. When I posted a picture of this on instagram, a lot of people asked me about the plate. It’s Chinoiserie Green, a design that Jasper Conran did for Wedgwood a few years ago. It was a birthday present from my best friend Victoria and remains a great favourite of mine. Put the cherries into a small saucepan and pour on just enough kirsch to cover. Bring to a very gentle simmer, then simmer for a couple of minutes. Remove from the heat and let the cherries fatten and cool completely. You can leave them for several hours if you like. Drain the cherries, reserving the liquid. Gently pat them dry with kitchen paper. Preheat the oven to 170°C/150°C Fan/Gas 3. 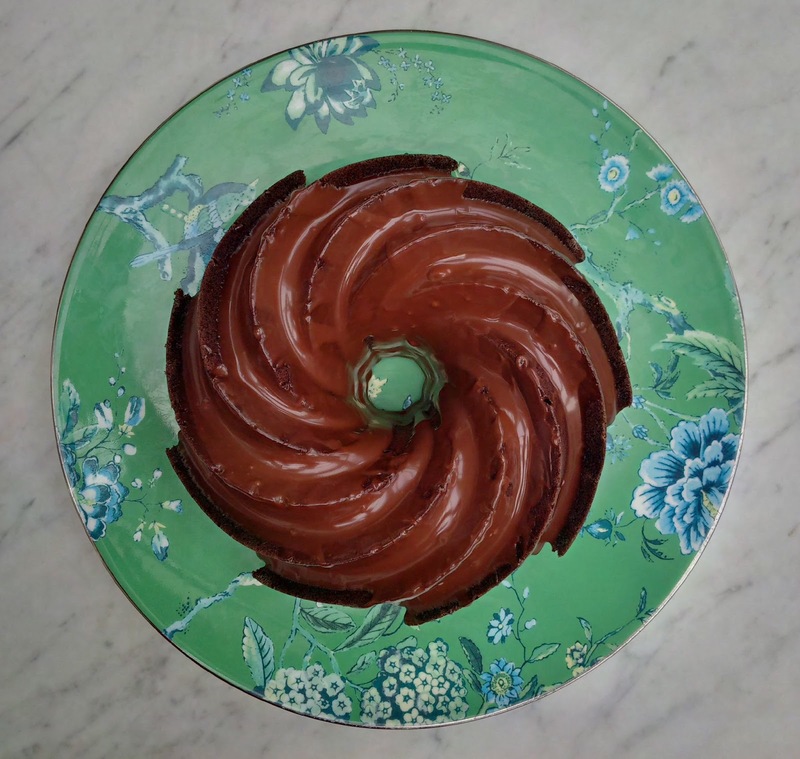 Grease a 2 litre Bundt tin with butter, sprinkle with flour, place in a plastic bag and shake shake shake until every part of the tin is lightly coated with the flour. Tap off any excess. Alternatively brush with Wilton Cake Release – this stuff is great for intricately shaped Bundt pans. In a bowl, whisk together the flour, cocoa, bicarbonate of soda, baking powder and salt until very well combined and light, with no lumps. Sprinkle a couple of tablespoons of the mixture on a plate and toss the cherries in it lightly to coat. In a separate bowl or a jug, whisk together the milk, sour cream and 1 tbsp of the reserved kirsch. In a stand mixer with the paddle attachment (of course you can do this in a large mixing bowl with a wooden spoon), beat together the butter and sugar until light and fluffy. Add the eggs one at a time, beating well after each addition. Beat in the orange zest. With the mixer on very low, beat in a third of the flour then half the milk mixture, then repeat, ending with flour – be careful not to overprocess the mixture or the cake will be tough. If the mixture seems a little stiff, add a splash or two of milk until it has a consistency which drops easily from a wooden spoon. Fold in the cherries with a spatula. Spoon the mixture into the pan and smooth the top with a palette knife or the back of a spoon – it shouldn’t come more than two thirds of the way up the tin. Bake for 65-70 minutes until a toothpick inserted into the thickest part of the cake comes out clean. Cool for 10 minutes in the tin. Remove the cake from the tin then place on a cooling rack lined with a sheet of baking parchment. Cool completely. When the cake is completely cold, make the icing. Place the chocolate in a heatproof bowl. Bring the cream to a simmer in a small saucepan. Pour the cream over the chocolate and leave to stand for a couple of minutes. Tip the butter and 2 tbsps of the remaining reserved kirsch (just swig any that’s leftover – it’s delicious) into the bowl and mix until smooth. Leave for a couple of minutes so that it thickens slightly. Pour over the cake and let the icing set before serving in thick slices, ideally at 11am. Liptauer, an easy and delicious snack. London is dark and damp. Walking Barney in Abney Park on Friday morning, the bitter smell of sulphur from the previous night’s fireworks hung in the air. 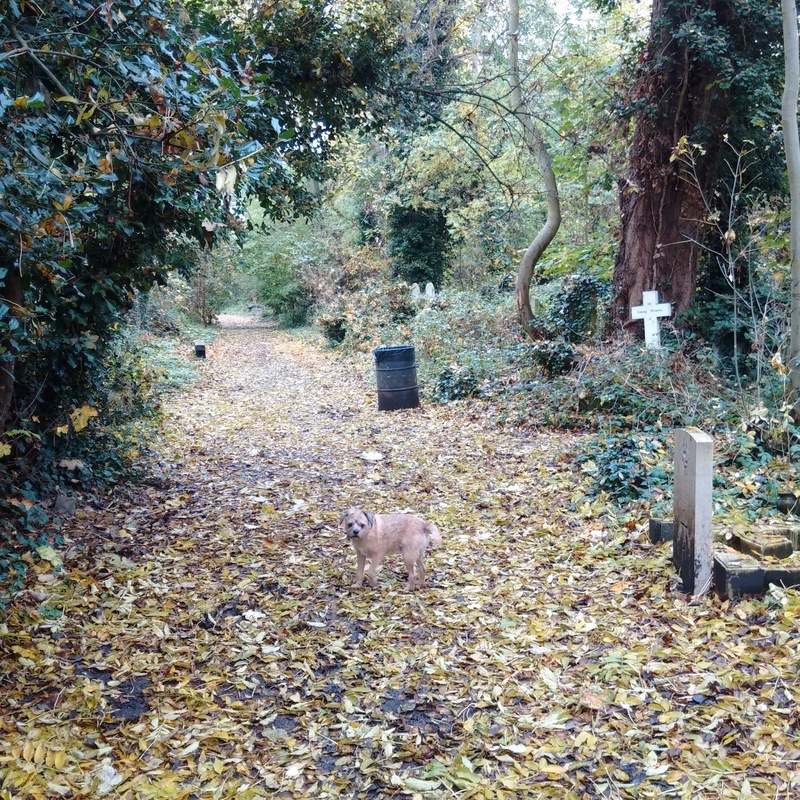 A damp dog walk in Abney Park. But all is not dreary. Our local church hall is hosting an evening of Sing Along A Sound of Music to raise money for UNICEF’s Sing for Syria appeal and my friend Liz has signed me up to help decorate the entrance to the hall in a suitably Austria en fête fashion. So last night, in Episode 1127 of my Jill Archer life, Liz came round to discuss the suitability of floral fabrics pulled messily from my craft cupboard and how many fairy lights was too many fairy lights. And by discuss I mean drink, and by fabric I mean wine. The Sound of Music is the first film I remember seeing, with my dad and my grandmother, aged about five or six, back in the day when small market towns still had cinemas, so it’s always had a special place in my heart. I also spent part of the summer I was 15 staying with friends of my parents in Vienna. My strongest memory of that trip is seeing women wearing dirndls in an entirely unironic fashion, to go to the office or walk to the post box. But I also remember eating liptauer, the hummus of the Austro-Hungarian empire, as a mid-afternoon snack. This spicy, paprika-spiked spread is terribly easy to make and I thought it would see Liz and I through our important decoration discussions. And it goes well with wine. The things that make liptauer taste so good. You can leave the butter out of this if you like (that’s not something I often say), and just make up the weight with more cream cheese or quark. Or you can substitute some cottage cheese for either. Just make sure it’s mixed until very well blended. In a mixer or with a wooden spoon, beat the butter until smooth then beat in the quark and cream cheese a little at a time until very smooth. Beat the rest of the ingredients until well combined. Taste and season with more salt, pepper and/or vinegar or cornichon juice if required. You can make the liptauer up to a couple of days ahead. I suggest you make it at least a couple of hours ahead for the flavours to develop. Seal in a tub or in a bowl with clingfilm and remove from the fridge about an hour before you want to serve it. Give it a good stir, spoon it into a serving bowl and sprinkle over some hot paprika. 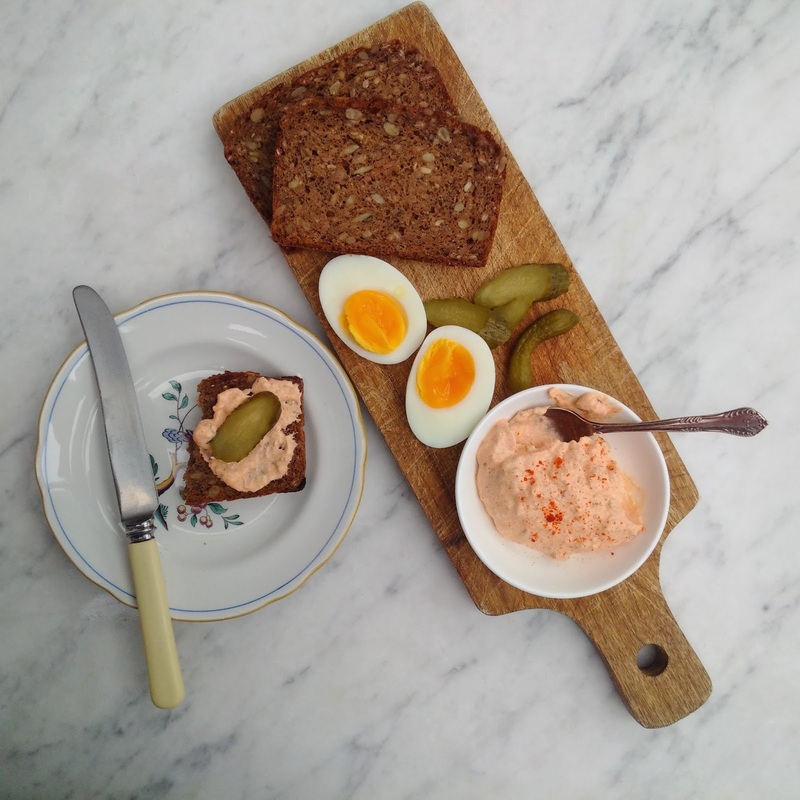 Serve with rye bread (you can lightly toast this if you like) and more pickles, and/or some chopped boiled egg. I will only share this recipe with you on condition you do not use wretched leftover Hallowe’en pumpkin to make it. 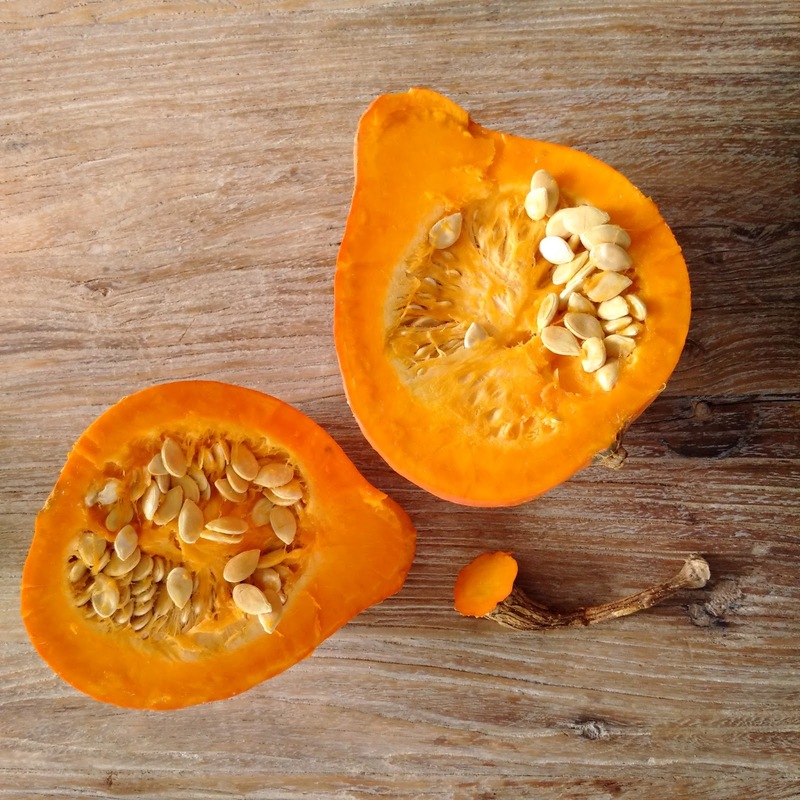 Yes, I know the world is noisy with magazines and papers and websites telling you, coaxing you, pleading with you – practically ordering you – to use this pitiful gourd in soups, cakes, curries and stir fries right now. But don’t. You’re better than that. Pumpkin ‘Jack of All Trades’, for it often he, is but tasteless, watery misery. His finest hour came when you shoved a candle into its sticky orifice and lit it. Let him go. Instead, use practically any other small pumpkin or squash. I used a small, heavy potimarron (this would be an excellent name for a proud but accident prone dog), often sold as uchiki kuri or onion squash in England. Crown Prince or butternut squash would also be excellent. 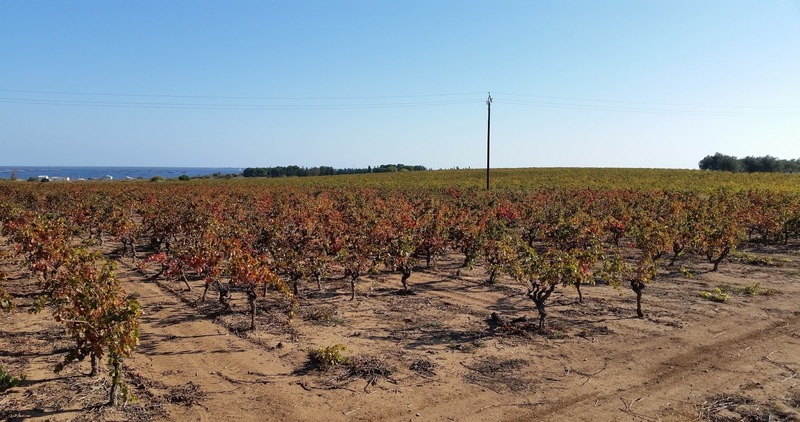 Across the vines to the oyster sheds and the sea. If I were ever to be a princess, I would dearly love to be Princess Potato. 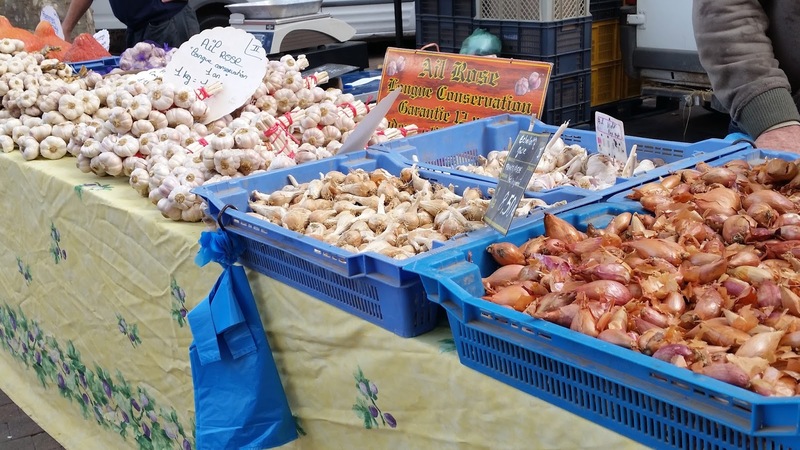 There has to be something wonderful about a region that has famous turnips. That’s my kind of celebrity obsession. 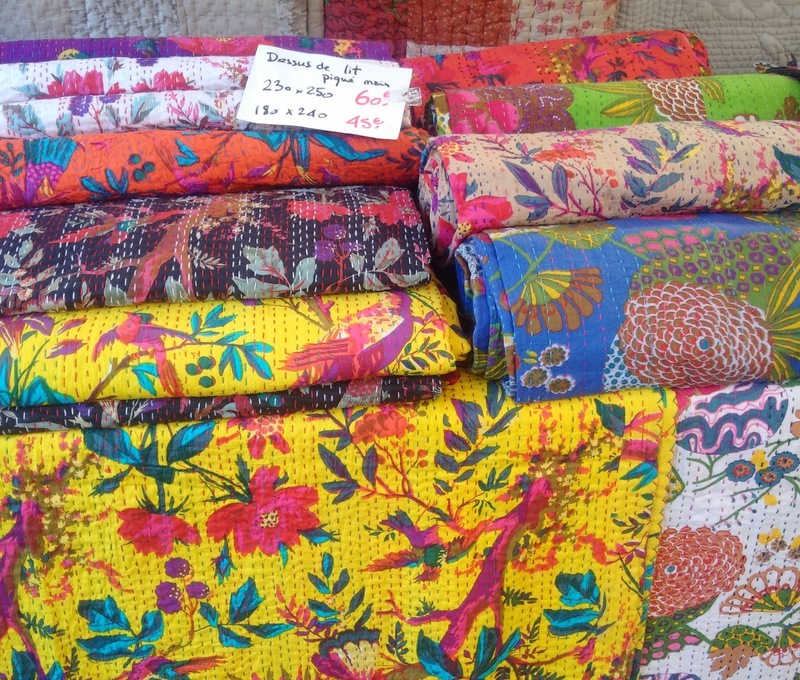 I love the colourful Chinese cushions and bedspreads you find on market stalls here. Their bright patterns remind me a little of traditional Provençal prints. Serve hot, with a salad. 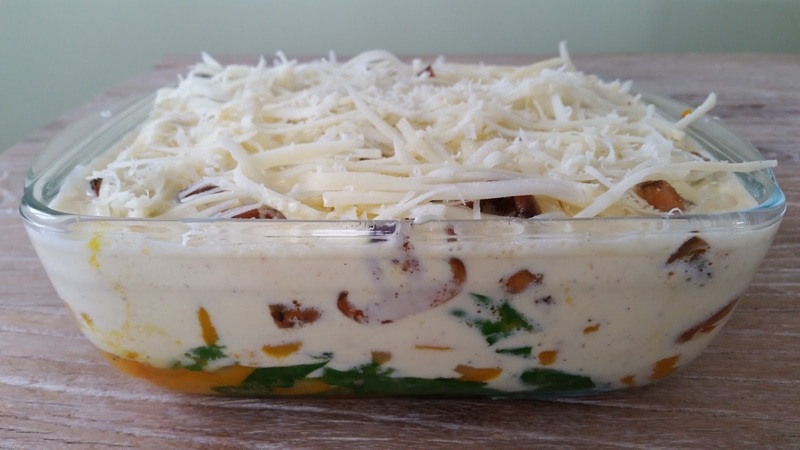 Serves 4-8, depending on whether it’s the main event or a side dish. Melt a generous knob of butter in a large frying pan over a medium heat. Add the pumpkin, onion, thyme if using, and some salt and pepper and sauté, partially covered and stirring from time to time, until the pumpkin is softened but still holds its shape. This should take about 20 minutes. Stir in the chard and stir until just wilted. Remove from the heat and set aside. Preheat the oven to 190°C/170°C Fan/Gas 5. Butter a large gratin dish or Pyrex dish. In a separate frying pan, warm another generous chunk of butter over a medium-high heat and when it stops foaming, toss in the mushrooms and a generous pinch of salt. Cook until a lot of their moisture has evaporated and they start to take on some colour. Add the garlic, fry for a further minute and remove from the heat. In a bowl, beat together the crème fraîche, eggs, mustard and nutmeg. Season well with salt and pepper. 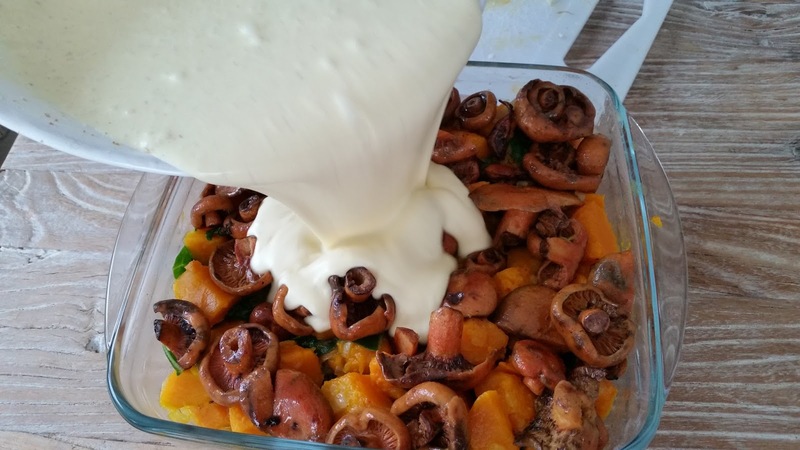 Tip the pumpkin mixture into the gratin dish (remove the thyme sprigs if you’re using them) and scatter the mushrooms on top. Pour the crème fraiche mixture over evenly and give the dish a shake and a tap on the table to distribute the liquid evenly. Scatter the gruyère on top. Bake for about 30-35 minutes, until the mixture is bubbling and golden brown on top. Serve hot, with a green salad and some bread. Pour on the crème fraiche mixture evenly. Remove from the oven when golden and bubbling. 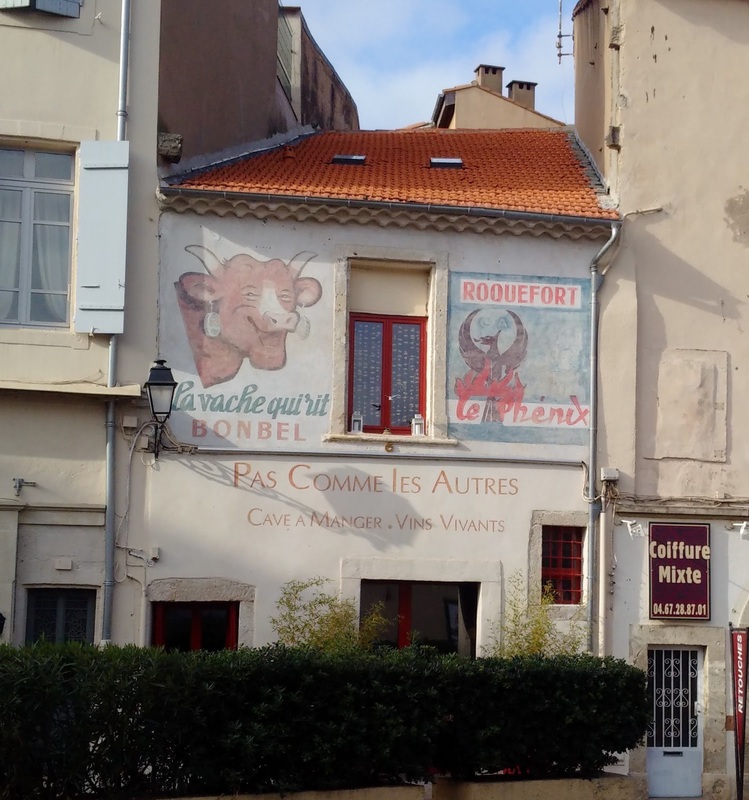 I liked this cheesy advertising in Beziers. Beziers is the closest city to us. It’s hilly. Even the water has to climb upward. Beziers is famous for the remarkable Fonserannes Lock, a staircase of eight locks which allows boats to rise more than 20m up the Canal du Midi in the least possible distance, with the least possible fuss. Every August over a million visitors come here to the Feria, the bull fighting festival, just one of the reminders of how close we are to Spain, and that this part of France perhaps has more in common with its southern neighbour than the buttery, apple-y North. On Friday morning we drove the 20 or so kilometres to town, to do some shopping, have some lunch. We started with the covered market, where we bought two kinds of olive oil and some honey vinegar. 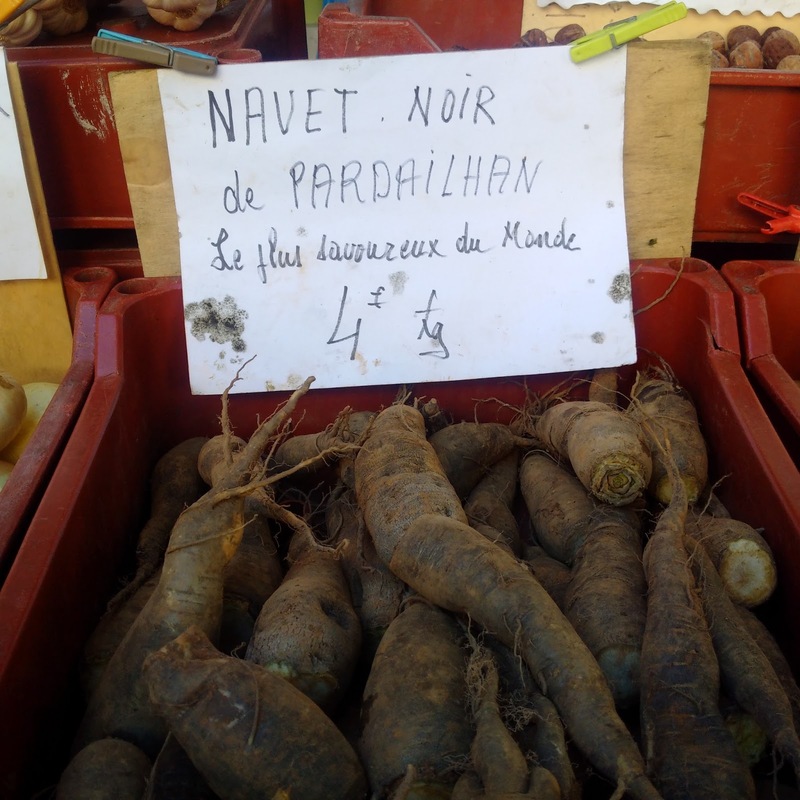 We managed to steer clear of the magnificently-flagoned bottle of vinegar ‘de région’ which cost 80€, which, incidentally, is the price of a kilo of pine nuts these days. 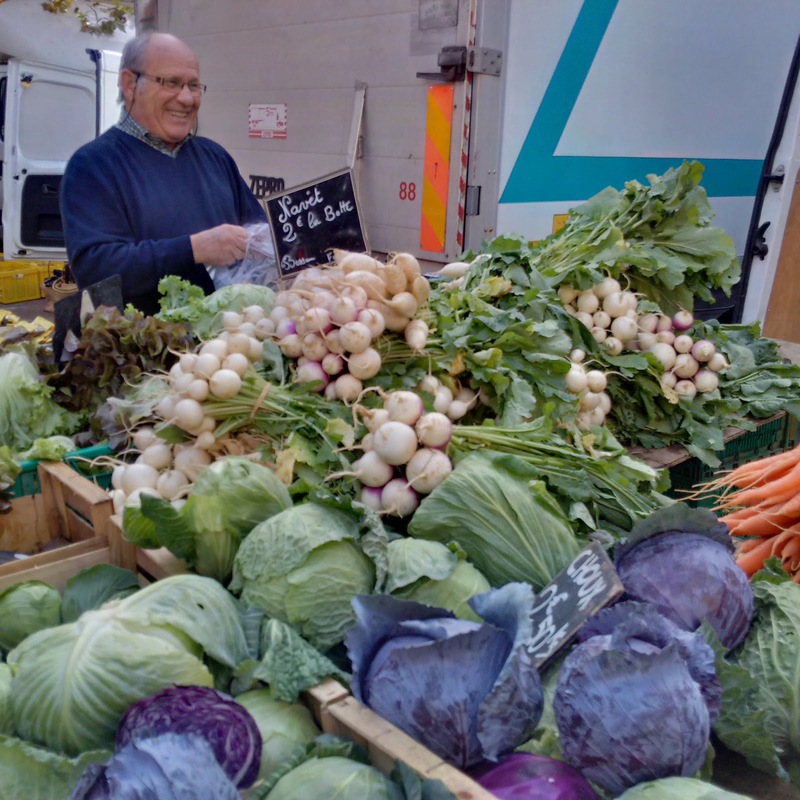 We walked down to the allées Paul Riquet, to explore the Friday flower market. Pierre-Paul Riquet was the mastermind behind the Canal du Midi, and Beziers favoured son. He certainly deserves his eponymous allées and the statue of him which stands proudly in the middle of the boulevard. 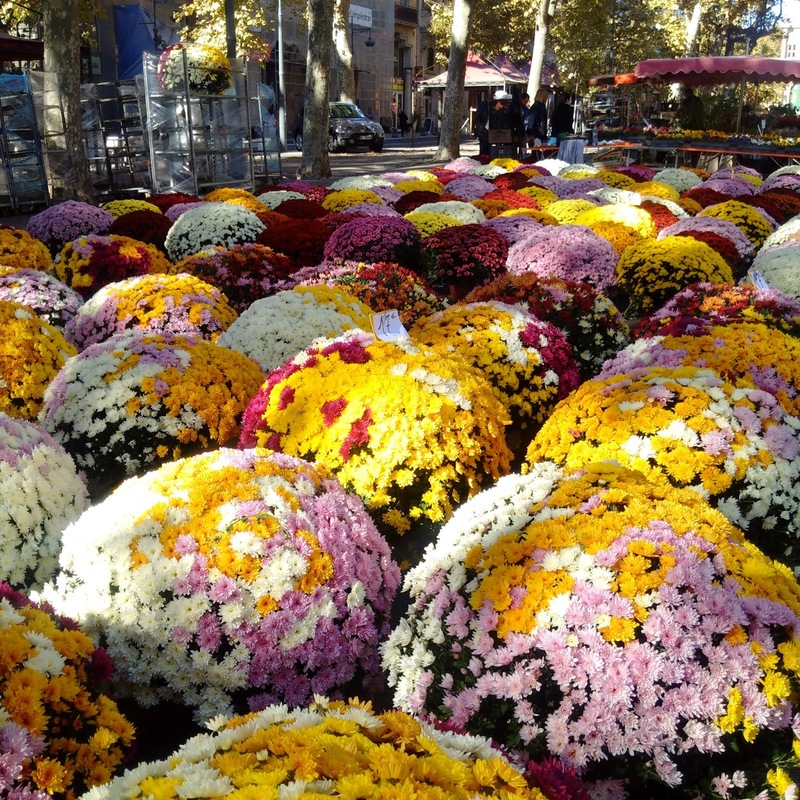 At this time of year, the market’s dominated by fat cushions of chrysanths, traditionally the flower of All Saints Day which falls on November 1. This is when French families remember their dead relatives by placing bouquets on their graves and, for this reason, in France chrysanthemums are associated with death. Tip: Do not take them as a gift for your host when invited to dinner in a French house and expect a warm reception. Fat cushions of chrysanthemums, destined for family graves. 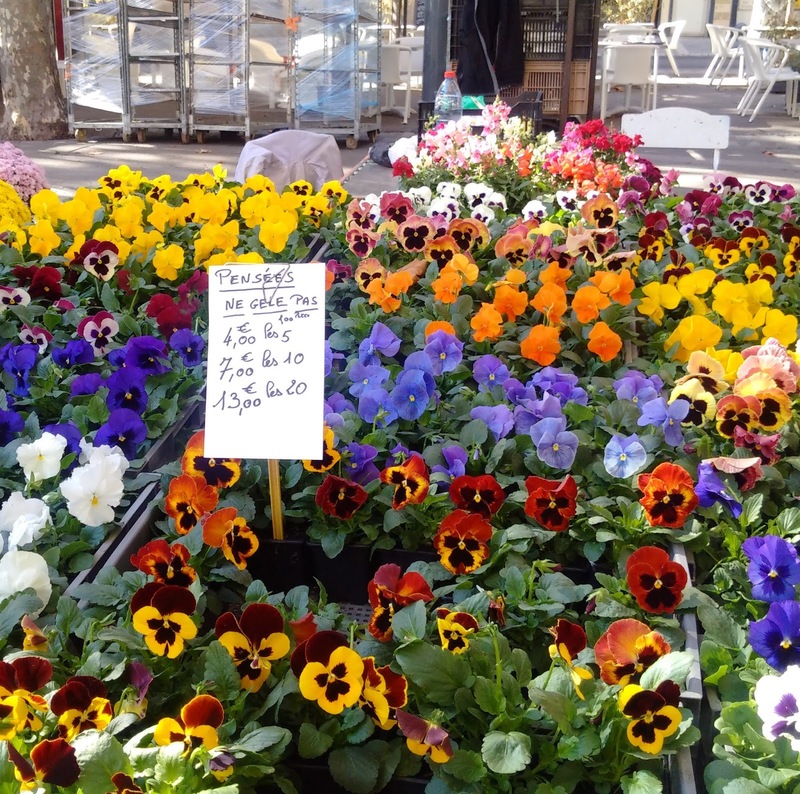 Our word ‘pansy’ comes from the French word, ‘pensée’, which means thought, probably because their pretty, velvety petals look like thoughtful little faces. 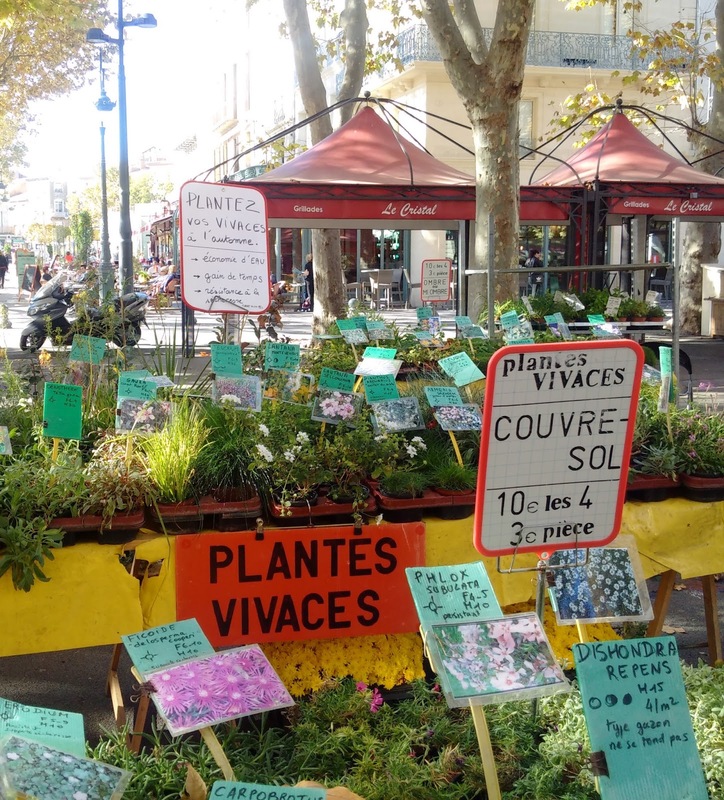 I like the French phrase for perennials, plantes vivaces. 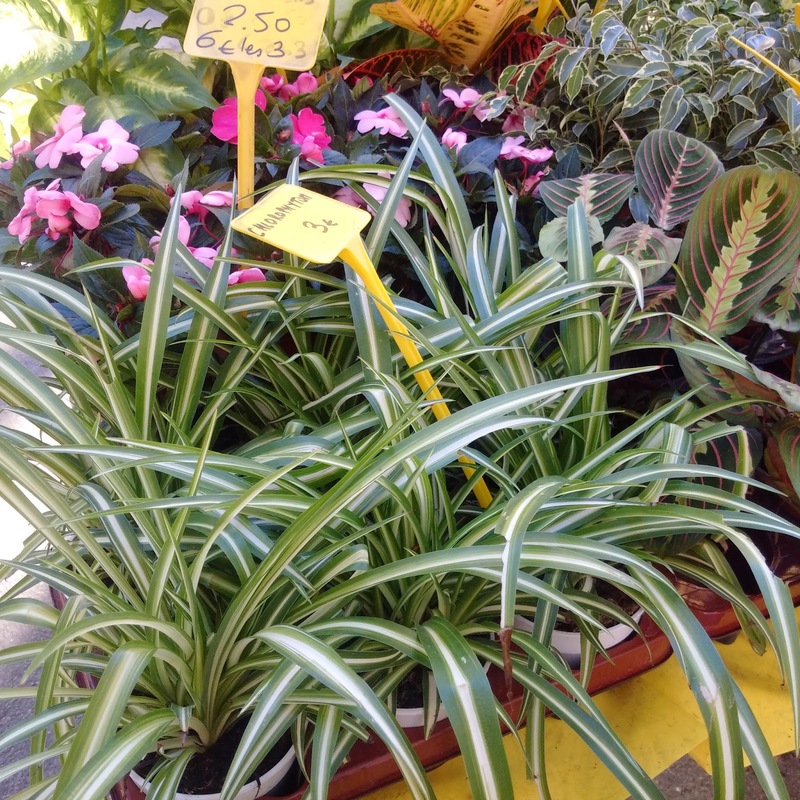 Having previously found them redolent of dusty offices and school art rooms, I suddenly find myself yearning for a spider plant. The heart wants what it wants. Walking back to the car, Séan lingered by the jewellery shop and then the posh handbag shop we’d passed on the way to lunch (steak frites at L’Orangerie. I highly recommend it). Would I like something, an anniversary present? 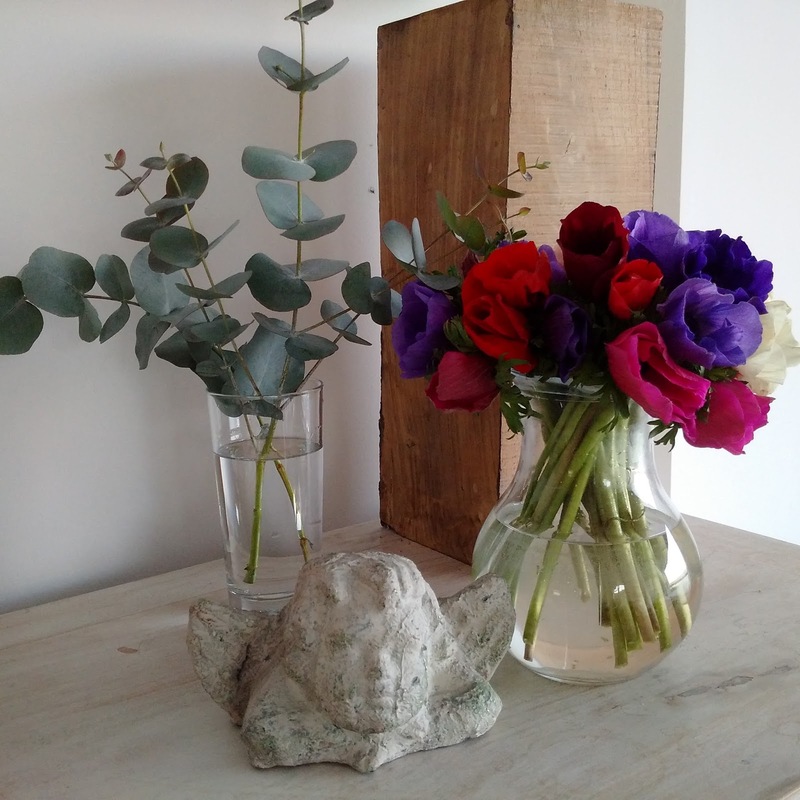 I clutched the bunch of anemones we’d bought at the flower market and told him no, really, these were enough. I am not a saintly person. I had already ascertained that a puppy was out of the question. 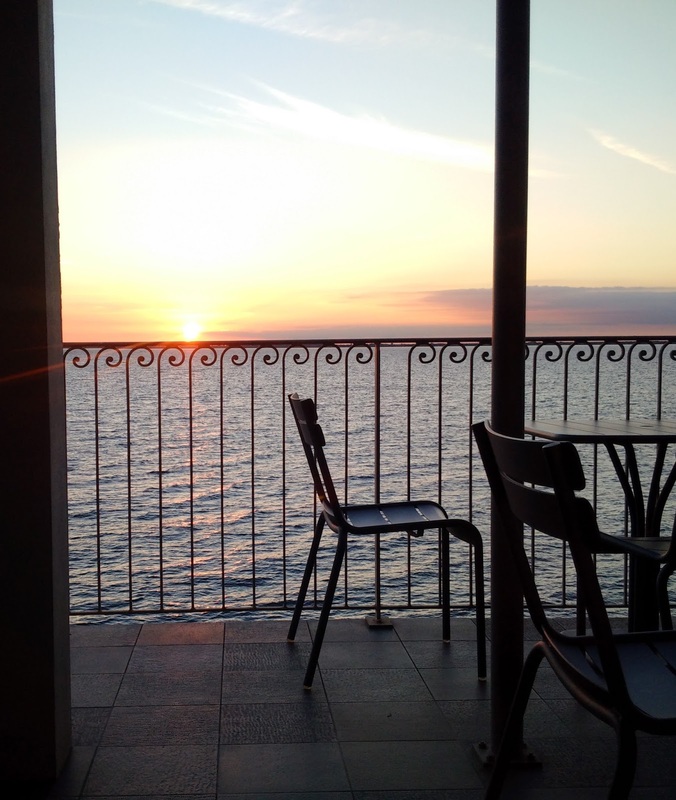 But what I wanted in that minute, more than pearls and fine, supple leather, was to lie on our bed with the doors open onto the balcony, to breathe the soft air from the étang until I fell asleep. Sleeping in the day is something I never do at home and it seems such a holiday luxury, I try to sneak a nap in whenever I can. It’s absolutely more precious than rubies. Nothing I desire can compare with it. 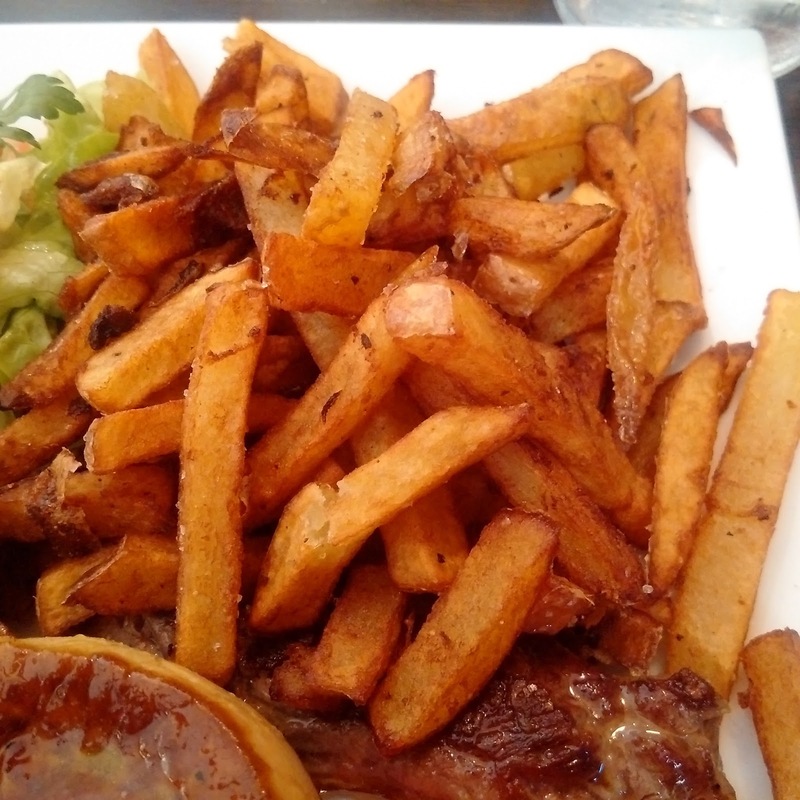 Proper coloured chips at L’Orangerie. My anniversary bunch of anemones. A couple of hours later, revived by sleep, entrecôte digested, it was time to think about dinner. 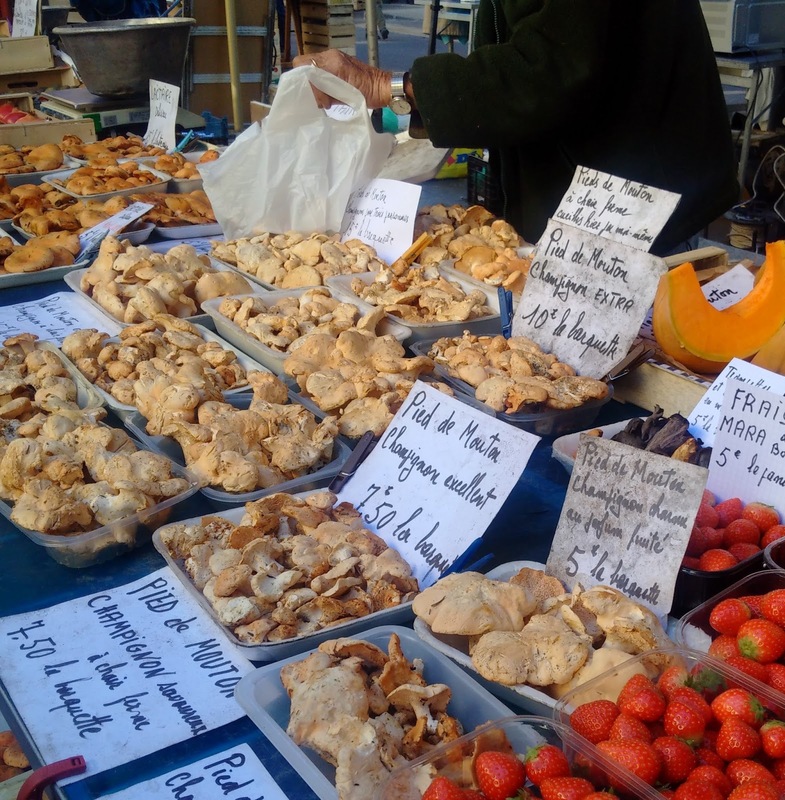 I had some squid we’d bought in Agde market on Thursday, but I have none of the arsenal I have at home -the hundred or so pots of herbs and spices, the freezer bags of long-simmered stock, and every possible appliance to blend, grate, purée any ingredient to my will. Here I am in a kitchen with no stock, very few herbs, and because we’re only here for a week I don’t want to buy too much. This is when it becomes important to sauté the onions properly and for long enough to round out their flavour, to use the skin and seeds of the tomato to profit from their fresh sweetness, to simmer the wine until it’s properly reduced, to season with salt and pepper throughout the cooking, and not just at the end. If you build flavour like this, you can get away with not using stock and it will still taste wonderful. I think we can get too hung up on recipes and forget to trust our senses – does it look good, smell good and, most importantly, does it taste good? Does it need to simmer a bit more to intensify the flavours? 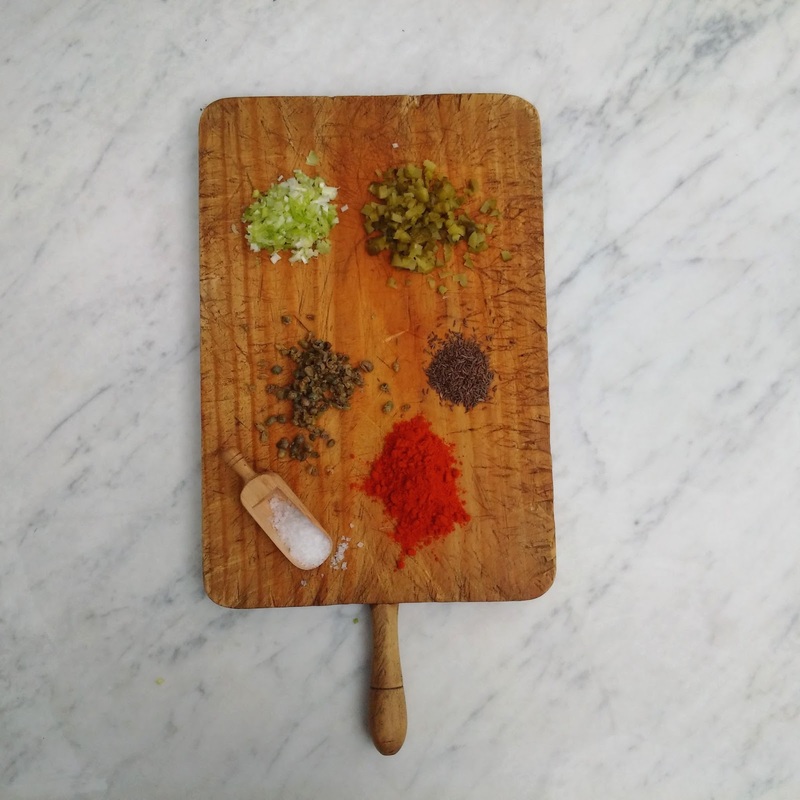 Does it need some more salt (often it needs more salt – this is one of the reasons good restaurant food tastes so delicious)? Perhaps a pinch of sugar? Use-what-you-have cooking is the very best lesson I know in squeezing every atom of flavour out of your ingredients. And it’s a lesson we can carry into our full-arsenal everyday cooking too. This is the view from our bed as the sun comes up. 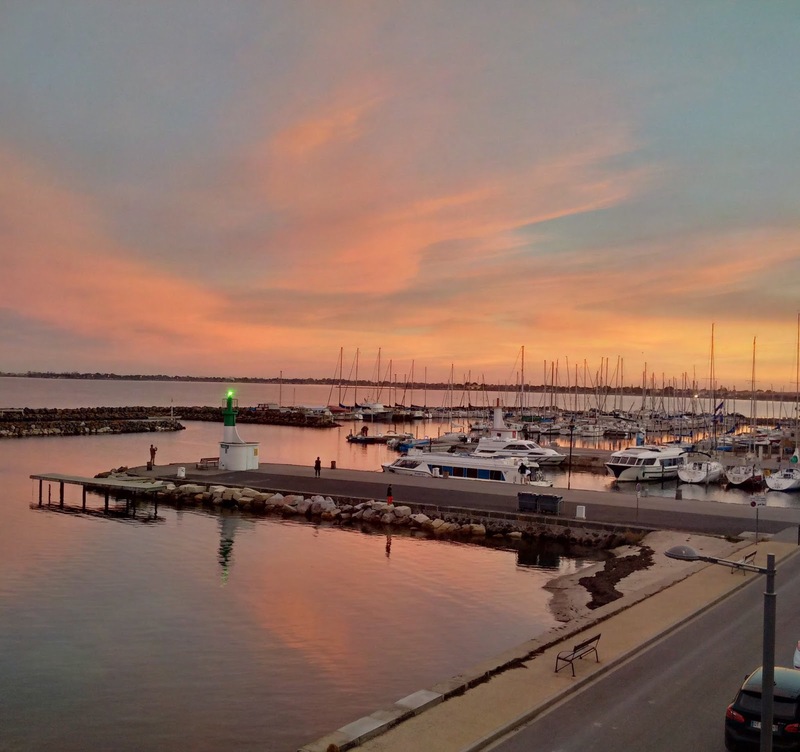 The sun comes up between 7.19am and 7.23am, rising swiftly from across the water and the road to Sète, turning the sky from pink to apricot to primrose, and filling the étang with rippled golden light. 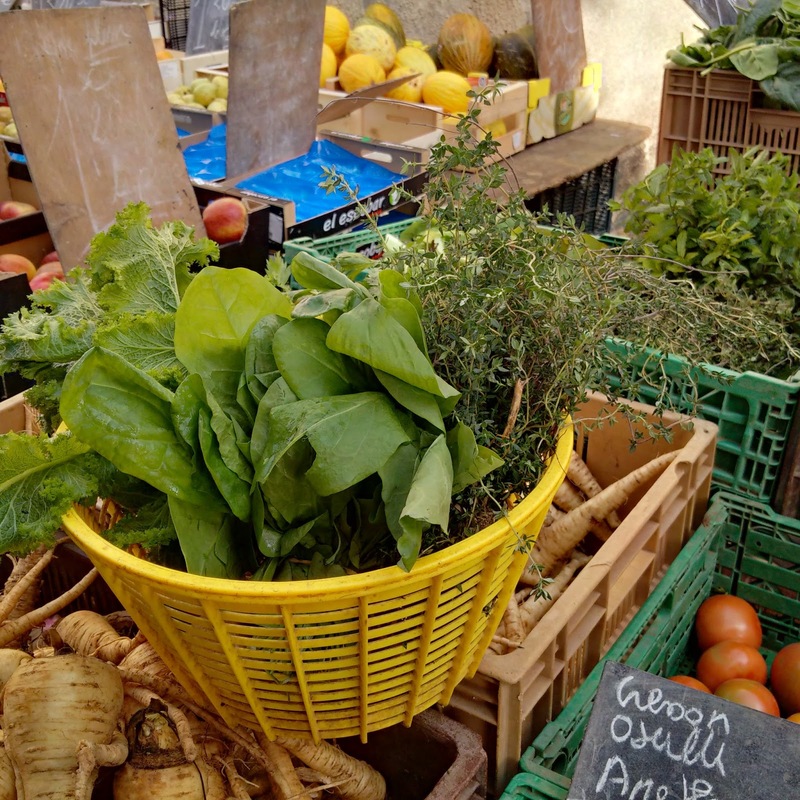 In the autumn, none of the markets sell baskets, even in Pézenas, possibly the most basket-tucked-firmly-into-the-crook-of-an-arm place on the planet. This can only be because no one shops between la Rentrée and Easter. I am a fool not to know this. When I posted a picture of this on Twitter, half a dozen people tweeted me ‘When I first saw that, I read it as squirrel’, something to do with the SQUId soRREL thing I imagine. It made me think about how we name recipes. I suppose the convention with recipe titles is: most important ingredient first, most interesting ingredient second and then a workhorse ingredient that’s seldom going to be the headliner but puts in a full shift to make it delicious. So there you have it: squid, sorrel and potato. No squirrels were harmed in the making of this soup. The sorrel adds a deliciously sharp flavour which is terrific with the squid. If you can’t find sorrel, use spinach and finish with a good squeeze of lemon juice. In a medium-large, heavy-bottomed pan, warm the olive oil over a medium-low heat. Add the onions, thyme, bay leaf if you have one, and a good pinch of salt. Cook until the onions are translucent, stirring from time to time, about 20 minutes. Add the celery and cook for a further 5 minutes, until it’s softened slightly, then add the tomato and garlic and stir for 5 minutes. Pour in the wine and simmer, stirring, until it’s reduced by half. 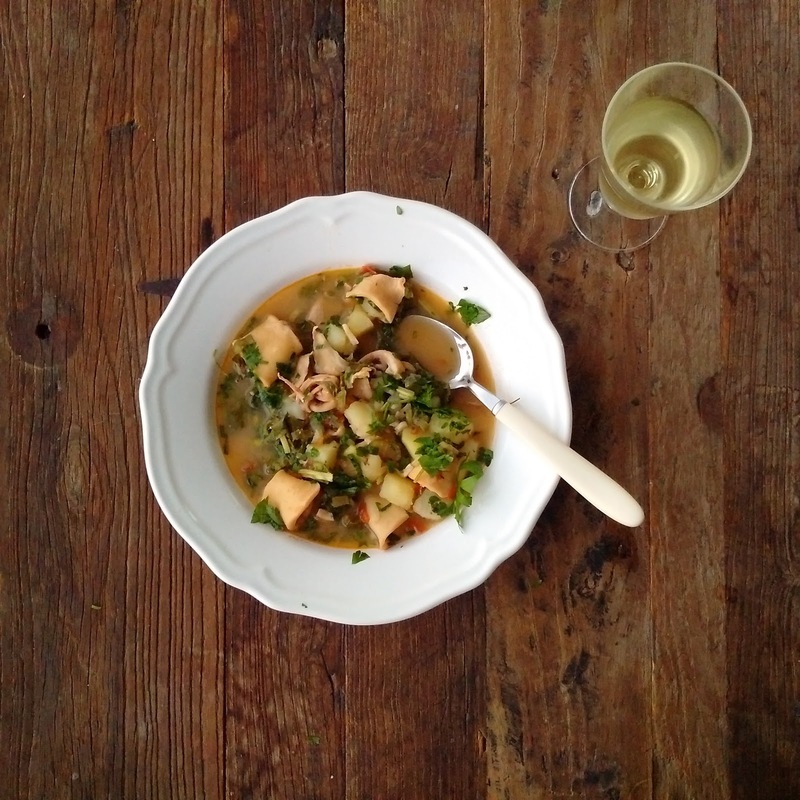 Add the squid, then the water or stock – you want enough just to cover the quid by a couple of centimetres or so. Throw in the bouquet garni, season with salt and pepper, and simmer gently, partly covered, until the squid is tender, about an hour to an hour and 15 to 20 minutes. Add the potato and cook until soft, about 15 minutes or so. Turn off the heat and stir in the crème fraîche, sorrel and parsley. The heat of the soup is enough to wilt the sorrel. You don’t need to cook it further. Remove the thyme, bay leaf and bouquet garni. Taste and season with salt and pepper. Serve immediately, in warmed bowls. 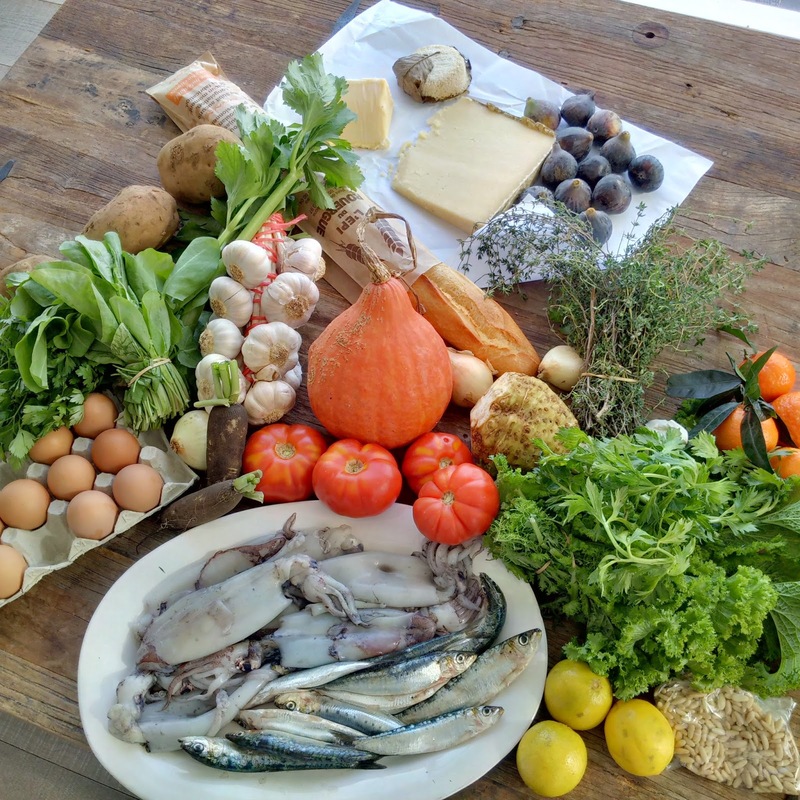 Autumn: This morning’s haul from Agde market. 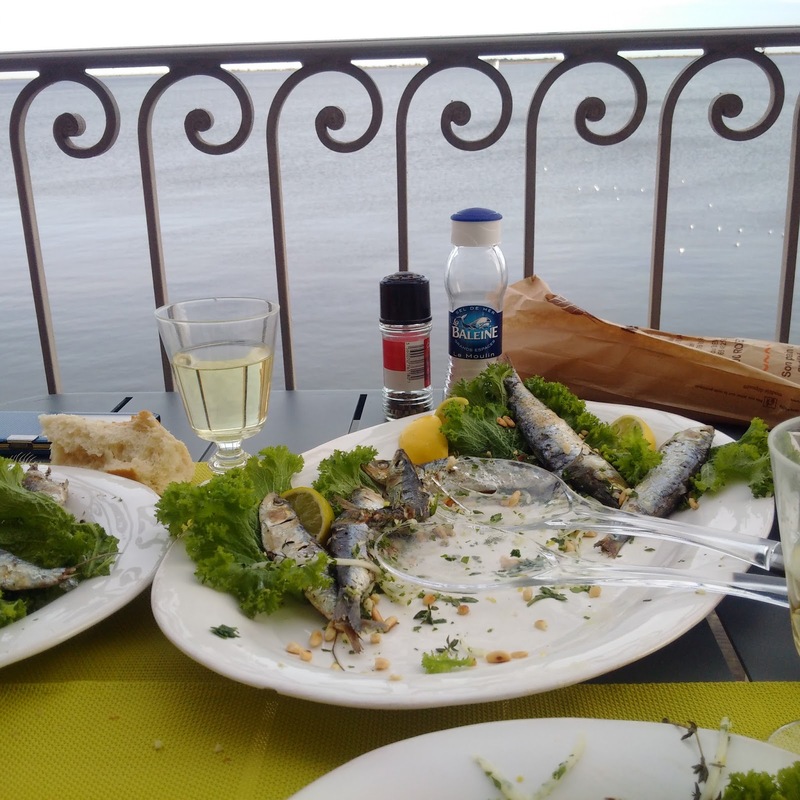 One of the things I love about being on holiday – along with sleeping late, reading a novel in a single gulp, and slummocking about with my hair lazily pulled back into a pony tail – is that holiday cooking is the opposite of work cooking. 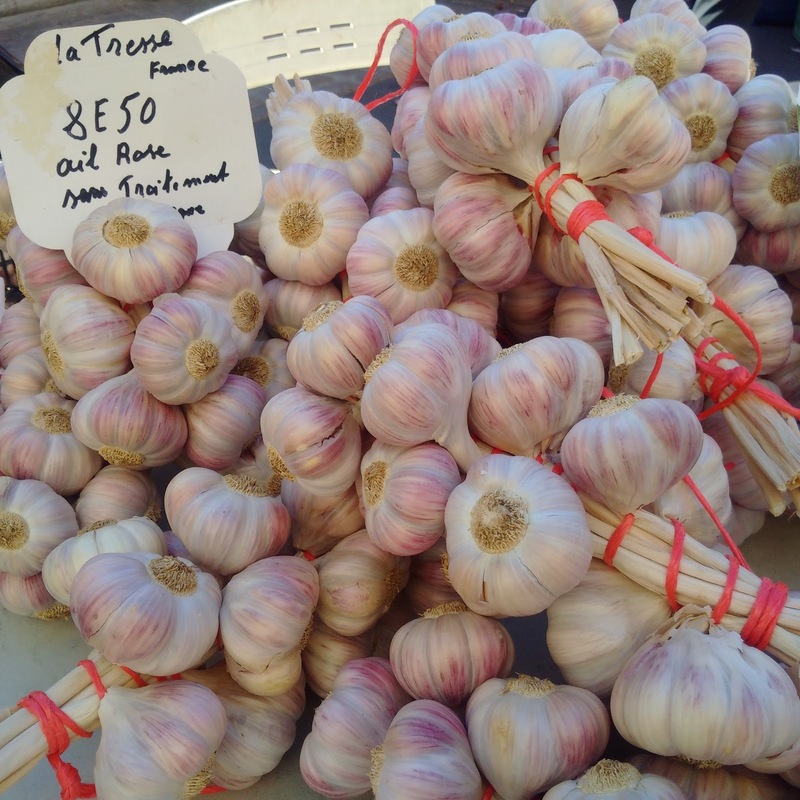 No measuring, note taking or trying to guess someone else’s intention, just the gentle pursuit of pleasure, inspired by wandering around the market or putting my nose round the cheese shop door and taking a good, life-affirming sniff. 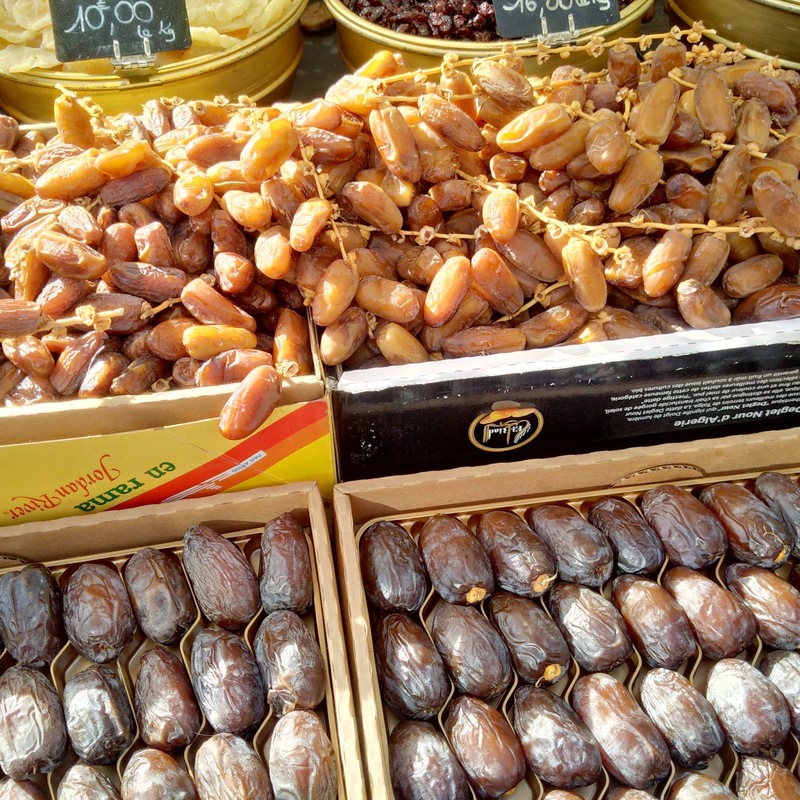 Today, on the first day of our little holiday, we got up early and made the short trip to Agde for market day. It’s a journey we’ve made many times before, but we’re always here in spring or summer. As we drove through fields of golden-leaved vines, it was almost like visiting a different place. 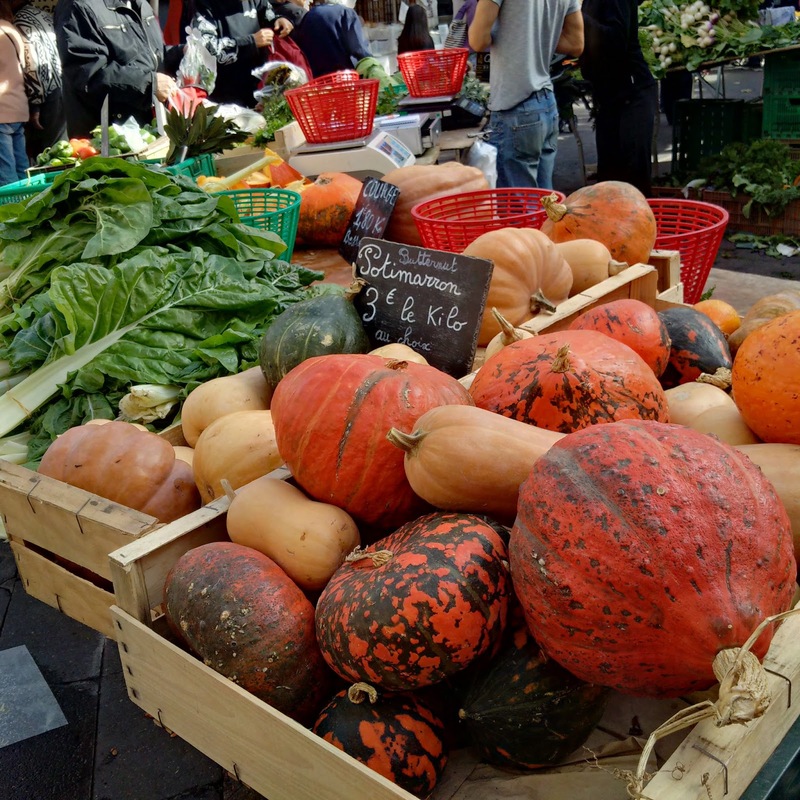 In the market, instead of summer’s peaches, cherries, melons and asparagus there were crates of pumpkins, walnuts and quince. And I bought what I liked, with no idea of what I was going to do with it and no scales to weigh it on when I did, I was cooking by instinct and inclination, changing the recipe as I chopped and grilled. The culinary equivalent of a lie in and a messy pony tail, and certainly none the less delicious for that. My basket of greens and thyme. 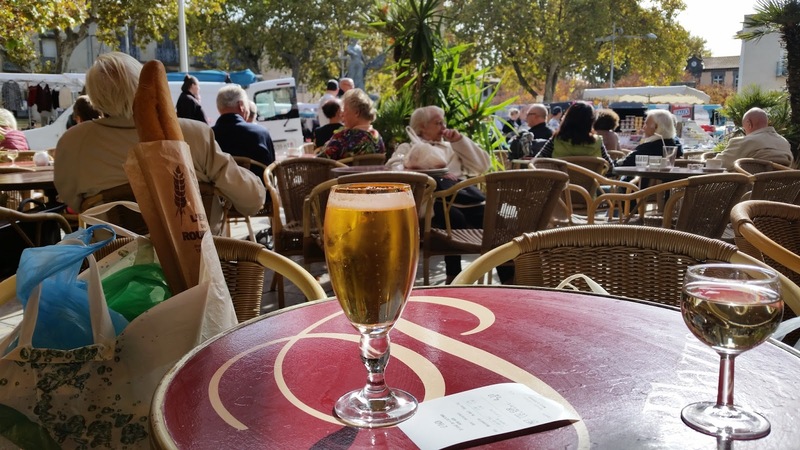 beer and wine at the Plazza. 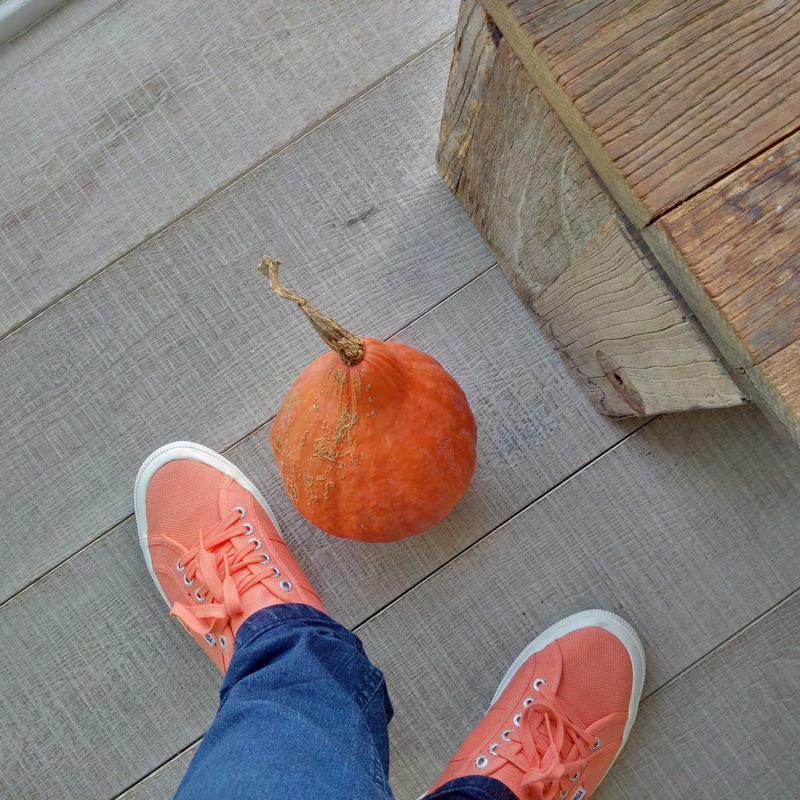 From now on, I’m matching my shoes and my vegetables. When I’m not cooking, I’m mostly looking out at this. As I arranged this salad on the plate, it reminded me of Stargazy pie, the Cornish dish where the heads of the fish poke out of the pastry lid as if caught mid leap. I am the very last person to send a salad to do a pie’s job, but if it’s salad you’re after this is a good one. The rich flesh of the fish goes well with the peppery mustard greens and crunchy, fiery black radish. If you can’t find black radish, just use pretty breakfast radishes sliced as thinly as you can. Serves 2-4, depending on how hungry you are and how much bread you might be inclined to eat along with it. First, make the salad. Peel the black radish and either julienne it very finely or grate it on the coarse side of a box grater. Dress it with a couple of squeezes of lemon juice and a trickle of olive oil. Toss it with the parsley, lemon zest and garlic, and some salt and pepper. 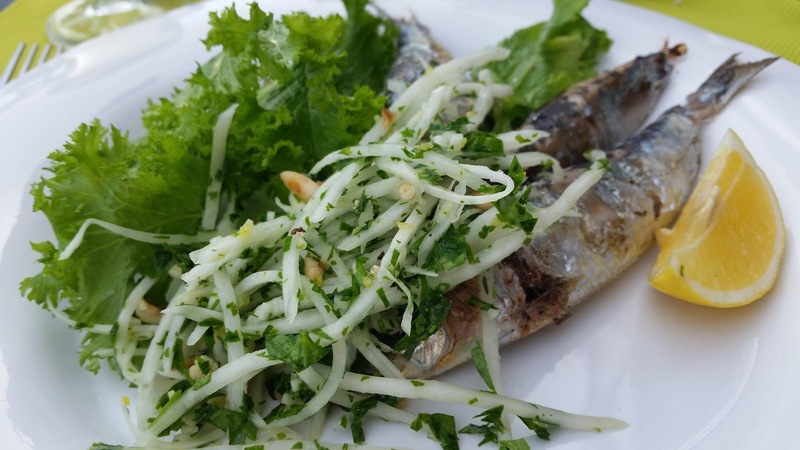 Set aside while you cook the sardines. Preheat the grill as hot as it will go (turn it on at least 5 minutes before you want to cook the fish). You can also cook these on a barbecue if you like. Line a baking tin with foil. Cut one of the lemons into thick slices and arrange them on the tin. Scatter some sprigs of thyme over the top (save a tablespoon or two of fresh, soft thyme leaves to finish the salad with). 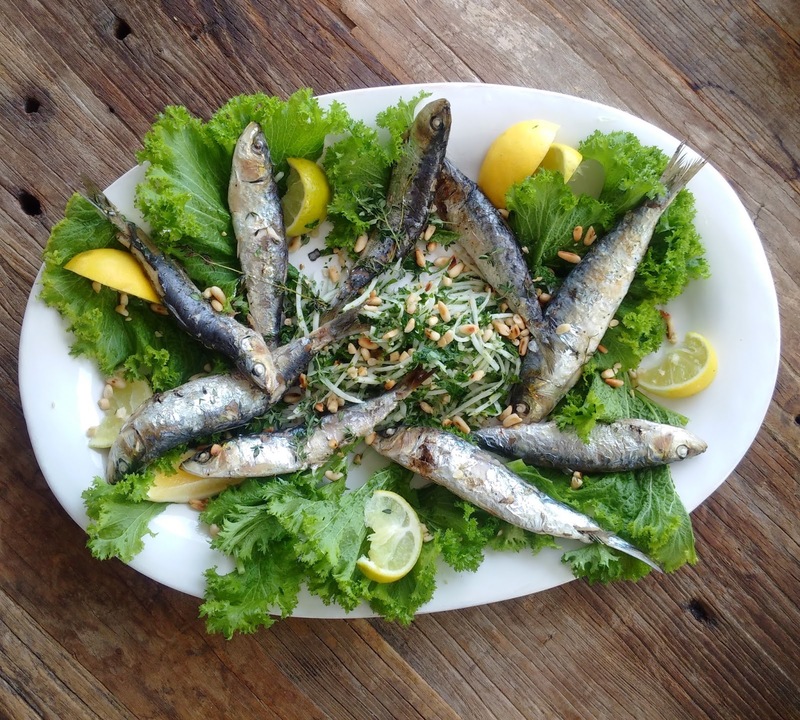 Place the sardines on top of the lemon and herbs, trickle over a little olive oil and sprinkle on some salt and pepper. 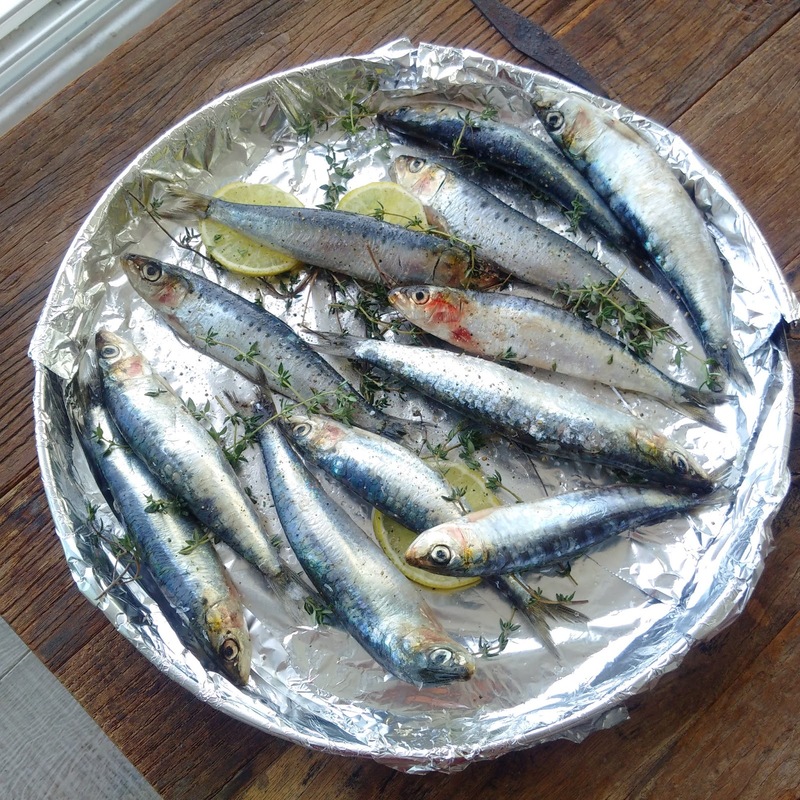 Grill the sardines until just cooked through – this should take about 3-4 minutes per side, depending on their size. Dress the mustard leaves very lightly in olive oil. Arrange them on a large plate. Heap the black radish salad in the middle and arrange the sardines around it. Scatter over the reserved thyme leaves, pine nuts and a good pinch or two of flaky sea salt. Serve immediately, with wedges of lemon. 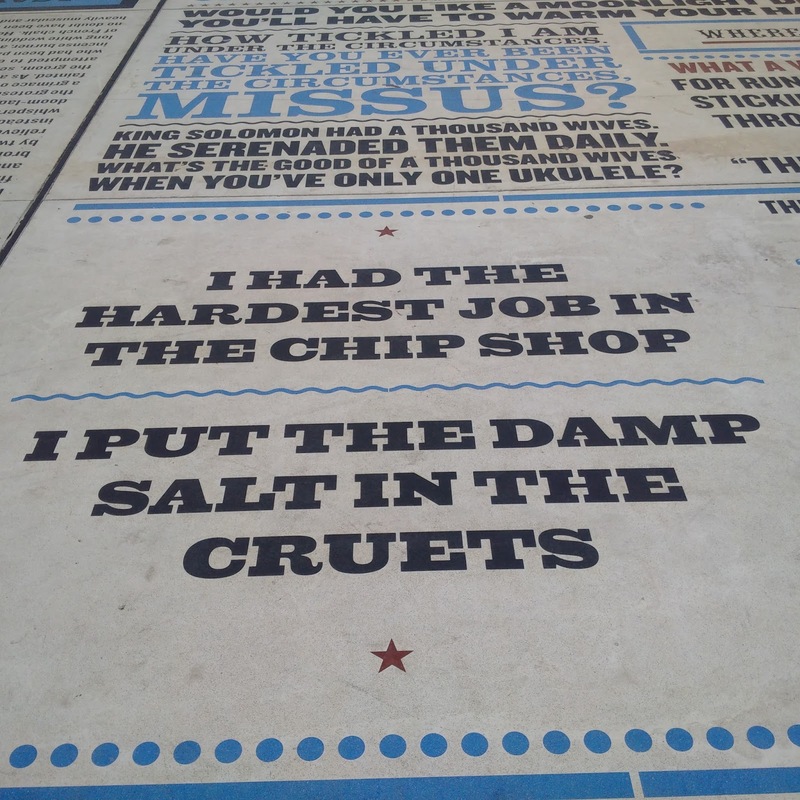 The English seaside. Not for the faint hearted. You know those conversations. You’ve had them. Sitting around in the pub with your mates and someone suggests you club together to buy a barge, or take up Morris dancing, or go part shares in a racehorse. It’s going to be brilliant. And then it’s tomorrow and no one ever mentions the barge, or the jingle bells or the horse ever again. Only this time, Nick was at the table and he’s the most efficient person on the planet. 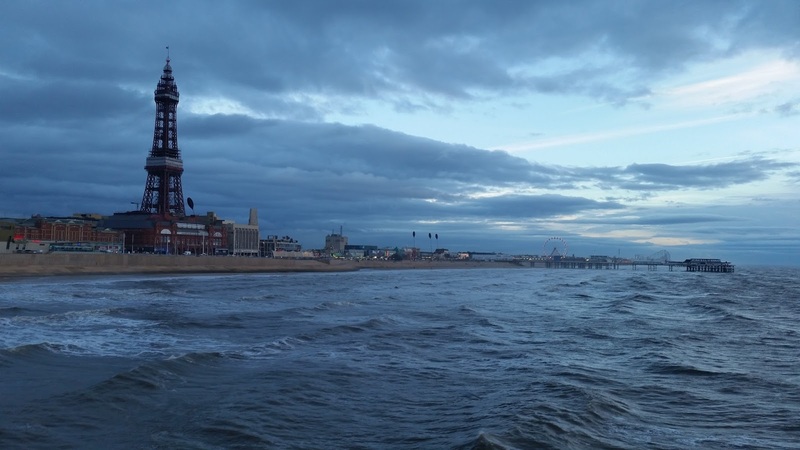 When he suggested a trip to Blackpool, his hometown, to see the Illuminations and we said yes, the tickets were booked and the day planned before the condensation had even dried on those craft ale glasses. On Friday we took the 8.30am train from Euston. I’d packed a bacon and egg pie and an iced thermos of Bloody Marys. The six of us were in a high old state of excitement and I felt a little sorry for the people surrounding us, clearly on their way to work, hoping to get a few hours on their laptop to catch up with their emails or play games or whatever. We were definitely the people you didn’t want in your carriage. We’d made a good inroad into pie and bloodies and laughing when Kirstin said ‘Is it even 9 0’clock yet?’. It wasn’t. I was worried we’d peaked too early. 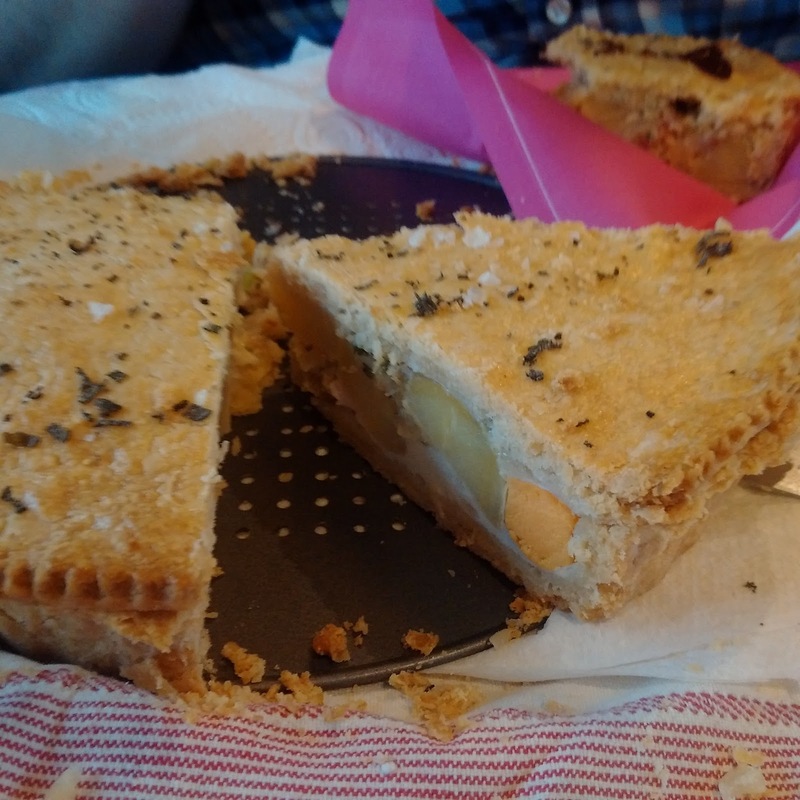 Pie at midnight – last minute preparations for our train breakfast. 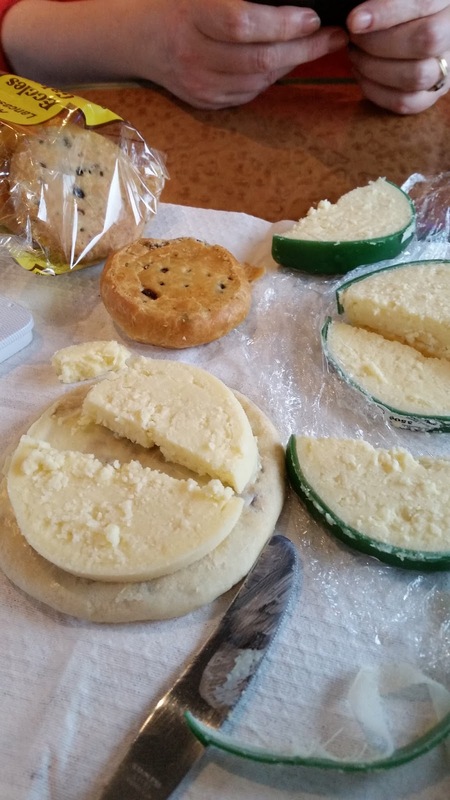 Train picnic: the Eccles cake v Chorley cake taste off, with some Lancashire cheese, naturally. Our bus got stuck in the funeral cortege of the man who allegedly kept the Krays out of Blackpool. Inside the vintage Austin hearse, his trilby sat on top of his coffin along with a huge cross of white chrysanths. On the side of the coffin, in foot-high letters, more white chrysanths spelled out ‘MIXIE’. 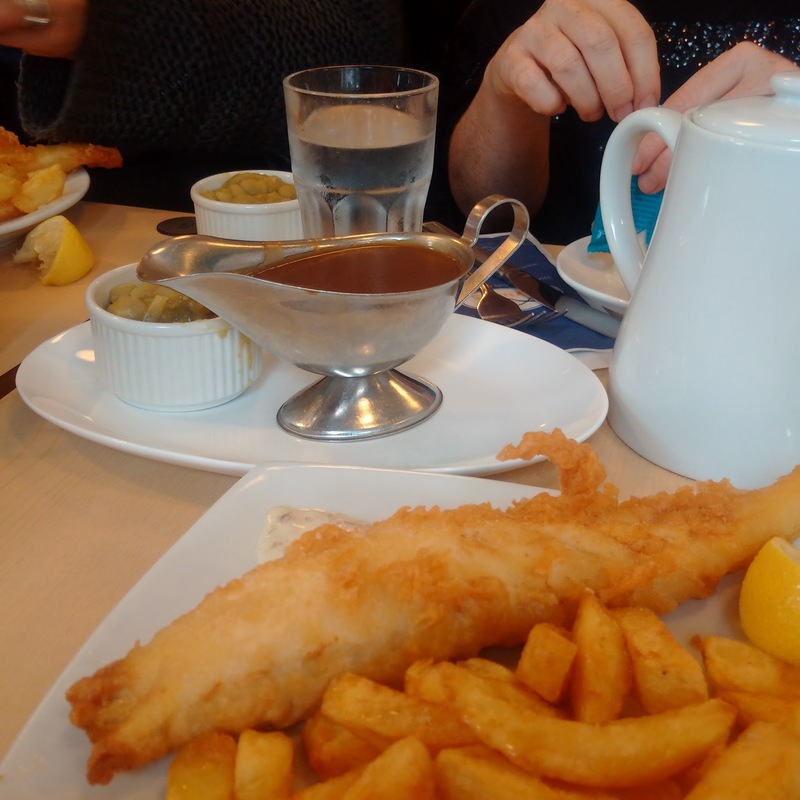 A delicious fish and chip lunch at Seniors (National Fish and Chip Award winner, 2012). I highly recommend it. The fish is super fresh, the batter light, the chips a proper shade (not the pale, sad things which’ve barely flirted with the fryer you get in the South), and the staff are charming. Seniors for lunch. Cod, chips, gravy, mushy peas and tea. Note the correct colour of the chips. I tried (very hard) and failed to win a pony key ring on the penny falls slot machine. I got far too goosebumpy at the sight of elderly couples waltzing around the Tower Ballroom in their best shoes, so nimbly and with so much mutual devotion in their eyes, as the Wurlitzer played Sunny Side of the Street. We whizzed up to the top of the Tower. I loved the views over the frigid North Sea and the rows of colourful Blackpool terraces. 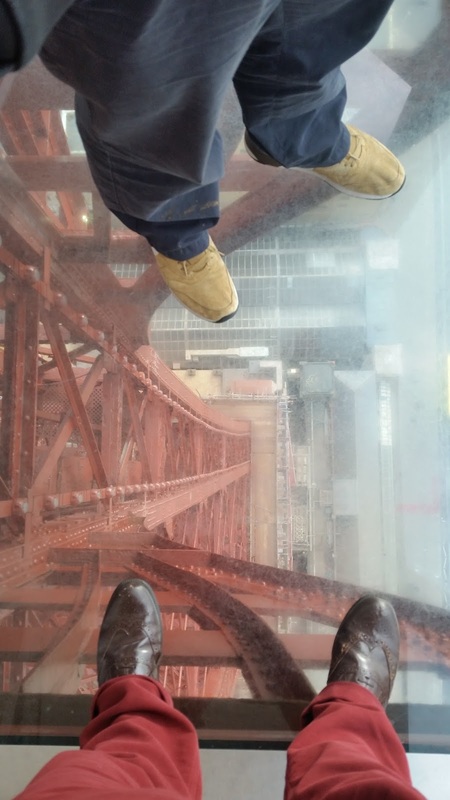 Nothing would induce me to step foot on the clear glass floor and look 380ft below to My Certain Death. Nothing would have got me onto the glass floor. 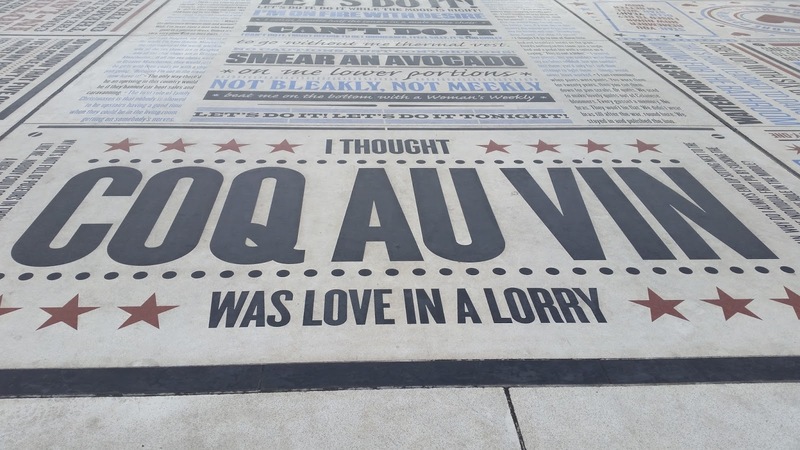 We skipped across the Comedy Carpet, Gordon Young’s tribute to English variety. 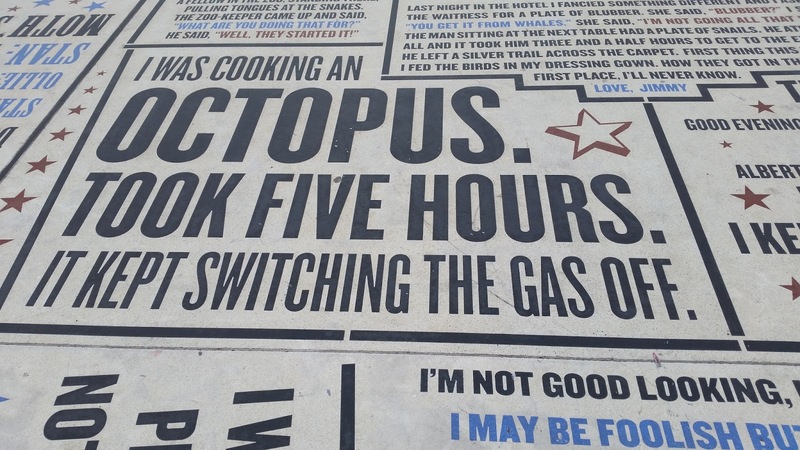 A pleasing number of terrible food-based gags. 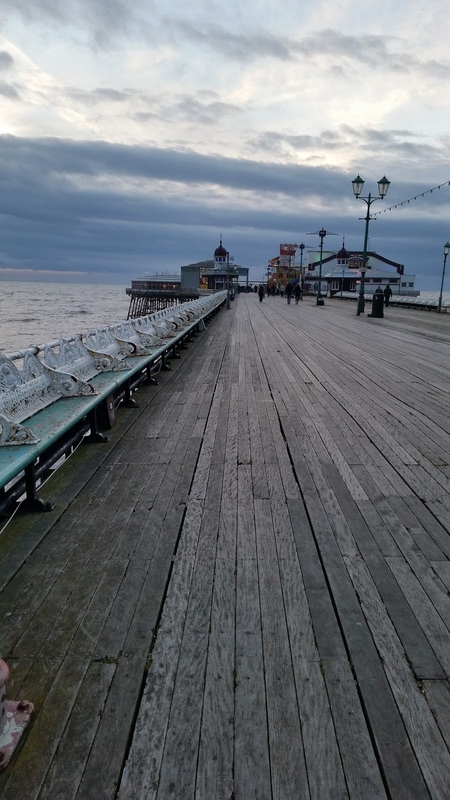 We saw a murmuration of starlings swirling above our heads as we walked along the wide, wooden pier in the grey, growing dusk. 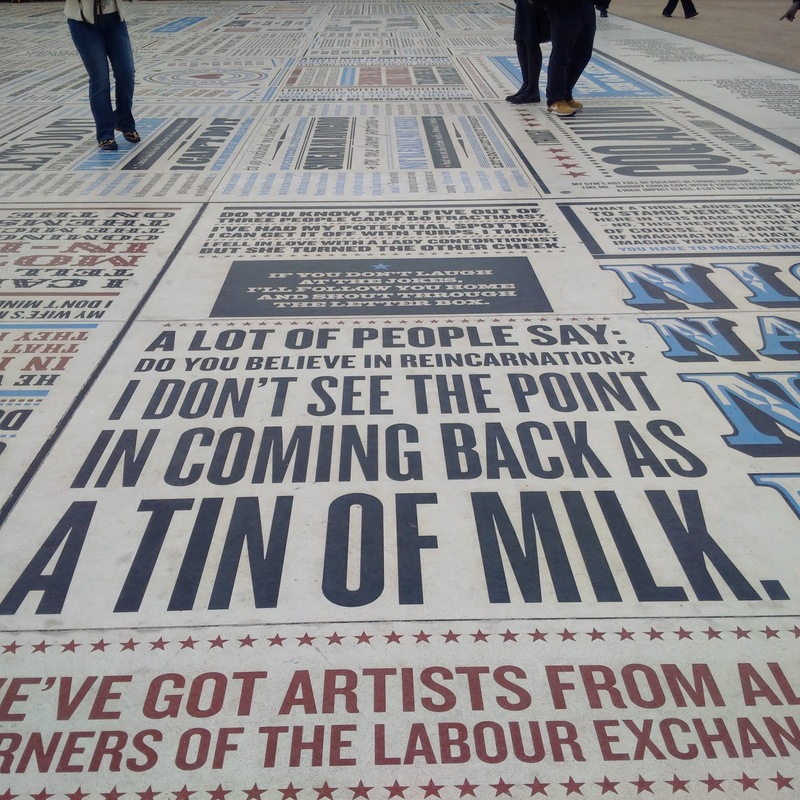 We rattled up and down the sea front on the tram, any city cynicism evaporating as the lights twinkled all around us. 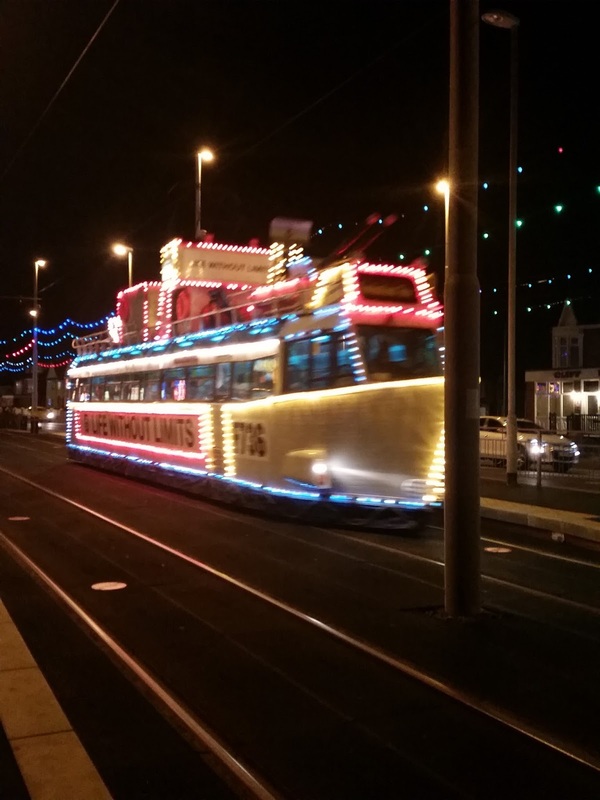 A tram, decked out with lights and dressed as an ocean liner. 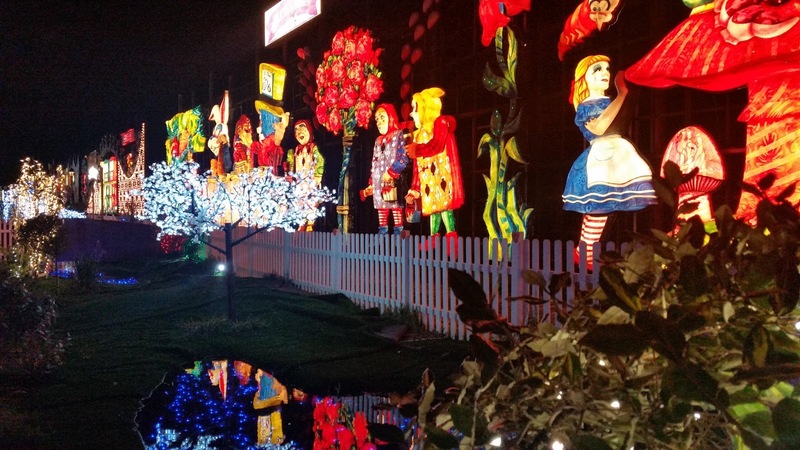 We walked along the last part, enjoying the tableaux, listening to grandparents tell their grandchildren about the light shows they remembered from their own childhoods, reciting nursery rhymes, holding on tightly to tiny gloved hands. Wine and cheese at Nick’s mum’s. We all agreed she looks like Helen Mirren. I didn’t have candy floss, whelks, a hot dog or my fortune told by Madame Petulengro. I also still want that pony key ring from the penny falls. For these reasons I must go back. 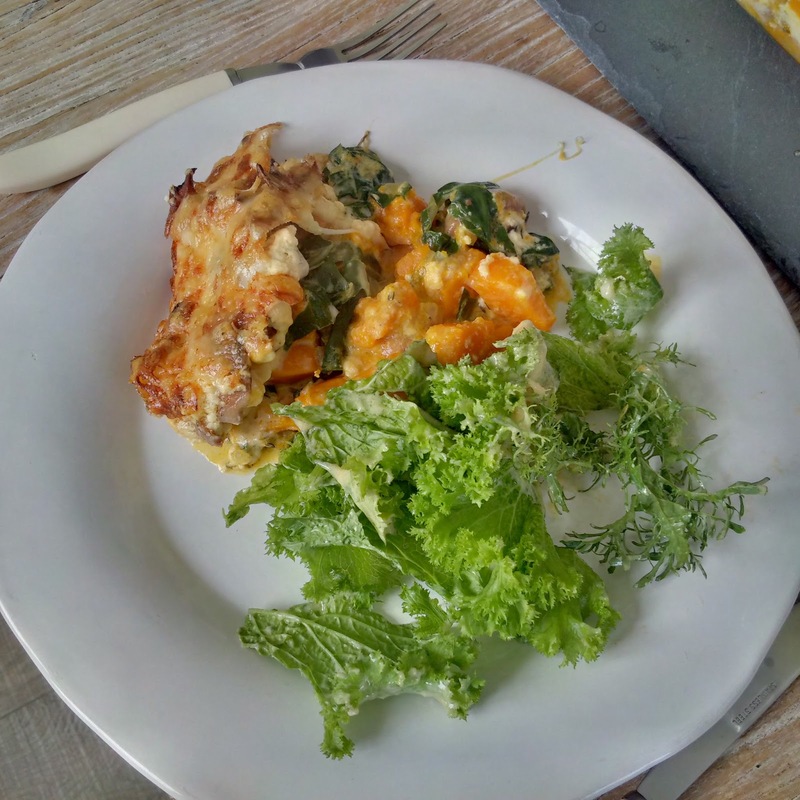 Breakfast pie – Note the whole eggs. My great auntie Louie was an excellent baker and made delicious bacon and egg pies. Hers most definitely did not have pancetta in them, but I was trying to use up some things from the fridge and I had a nice chunk hogging a corner of the deli drawer. 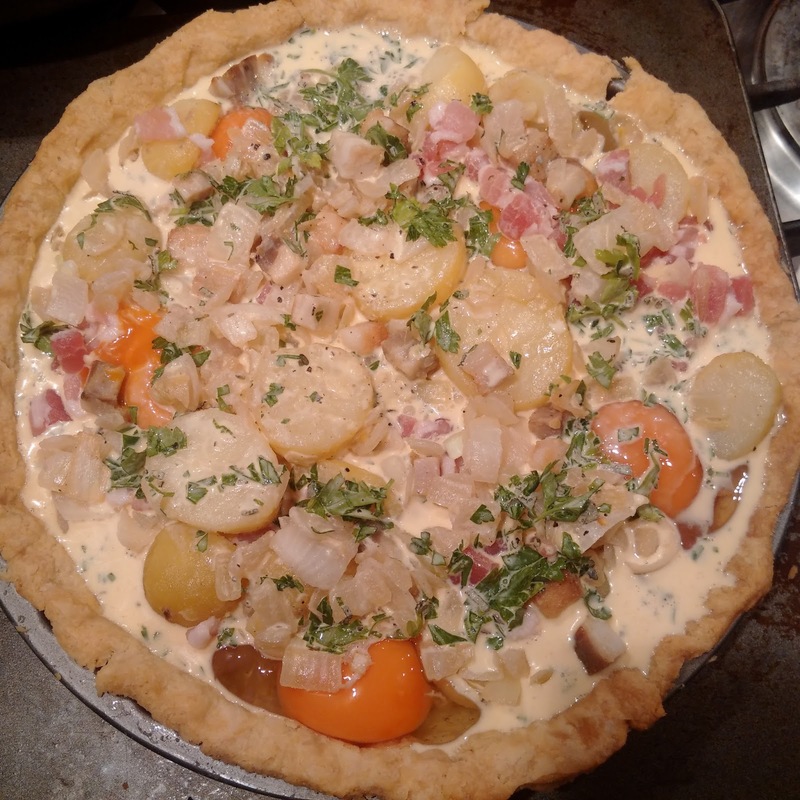 You can use just bacon if you like – just cook a bit of it to render out the fat to fry the onions in, and leave the rest raw to bake in the pie. First make the pastry. Whisk together the flour and salt in a bowl then rub in the lard and butter until it resembles coarse breadcrumbs – you still want some lumps of fat in the dough to ensure a nice, flaky pastry. Make a well in the middle and add the eggs a little at a time, using a knife to cut them into the mixture. Add just enough water to bring it together into a dough, kneading very lightly with your hands to bring it together into a smooth disc. Wrap in clingfilm and chill in the fridge for at least an hour. 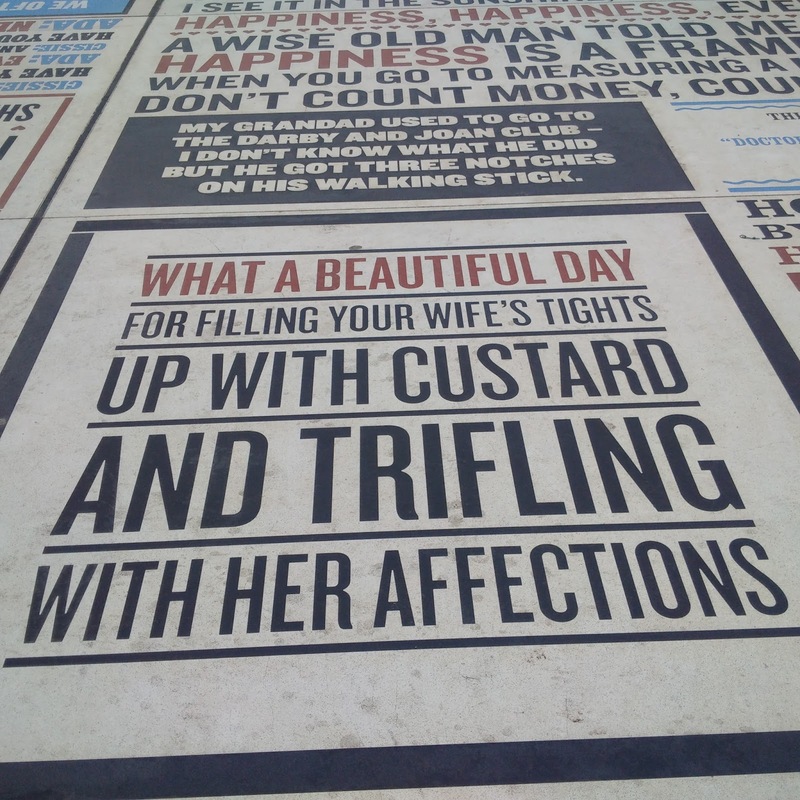 You can make this a day or so before you want to make the pie if you like. 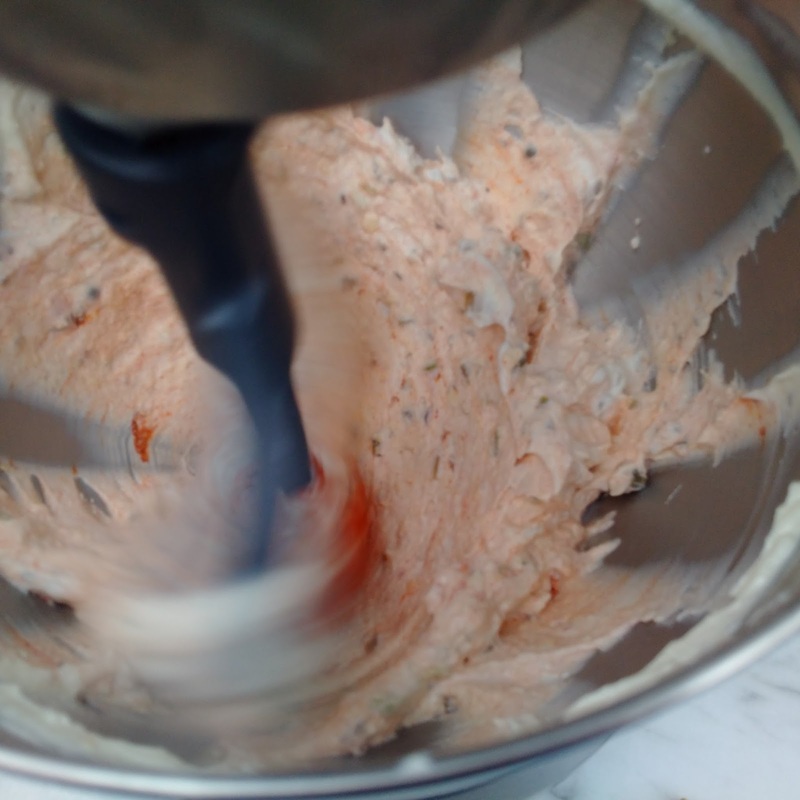 Of course, you can make this in a food processor but be very careful not to over process it – use the pulse button and only work it until it just comes together. Lightly flour a clean surface and a rolling pin. 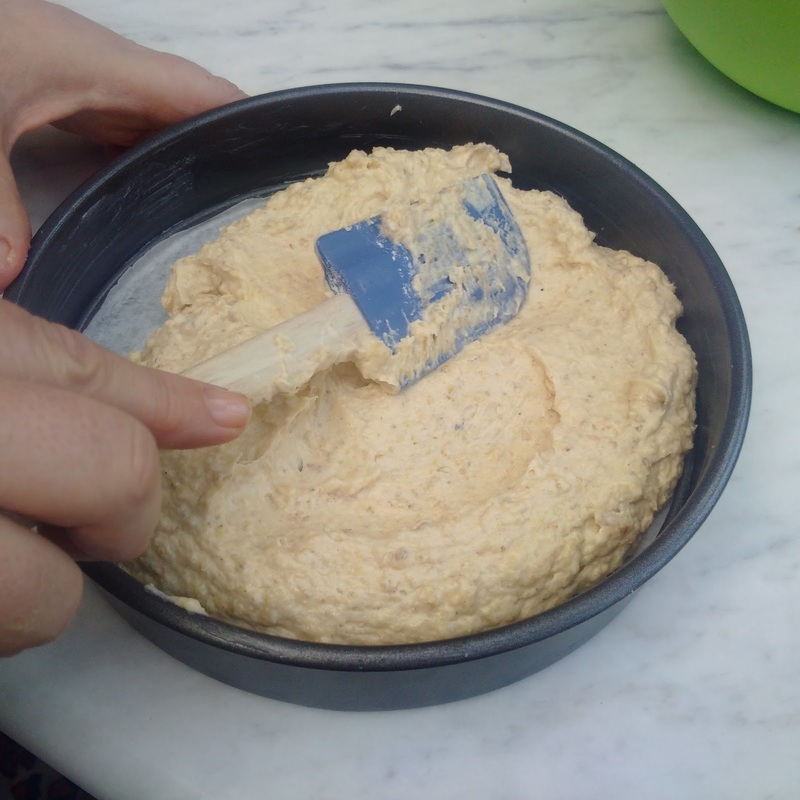 Cut the dough in half and roll one piece out into a circle of approximately 30cm diameter. Use the pastry to line a 23cm loose-bottomed flan tin, pressing it gently into the corners, then trim and crimp the edges. Put it back into the fridge to chill. Roll the second half of the pastry out and trim into a 23cm circle (use a plate or the base of a flan tin as a template); place on a baking sheet and put it in the fridge. Chill the lined flan tin and the top for at least 30 minutes. While the pastry is chilling, prepare the filling. Warm the butter gently over a medium heat and when it stops foaming, add the pancetta. Cook until it’s rendered some of its fat and turns lightly golden. Remove to a plate with a slotted spoon. Tip the onions into the pan with a pinch of salt and a bay leaf and reduce the temperature to medium low. Cook, stirring from time to time, until the onions are soft and translucent, about 15 minutes. Put the potatoes into the pan along with the reserved pancetta. Turn everything over for a couple of minutes then remove from the heat and discard the bay leaf. Cool. Preheat the oven to 180°C/160°C Fan/Gas 4. Place the lined flan tin on a baking sheet. Prick the base and sides with a fork. Line the tin with crumpled baking parchment and fill with baking beans and/or uncooked rice or pulses. Bake for 18 minutes. Remove the parchment and baking beans. Return the flan tin to the oven and bake for 7-10 minutes until the base is completely dried out and beginning to turn golden. Increase the oven temperature to 200°C/180°C Fan/Gas 6. Spoon half of the pancetta, onion and potato mixture into the bottom of the pie. Scatter on the bacon and spring onions, then spoon the remaining pancetta mixture over the top. Using the back of a spoon, make six evenly-spaced hollows around the edge of the pie. Crack a raw egg into each of the hollows. In a small bowl, whisk together the remaining egg with the cream. Tip a couple of tablespoons of this mixture into a small bowl and reserve it to glaze the pie. Stir the sage, parsley and nutmeg into the remaining mixture and season well with salt and pepper. Pour over the top of the pie filling and give the tin a little shake to distribute it evenly. Brush the edge of the pie with some of the egg and cream wash. Carefully place on the remaining disc of pastry. It should be a good fit, with no overhanging pastry. Press it down firmly with your thumb or a fork to seal. 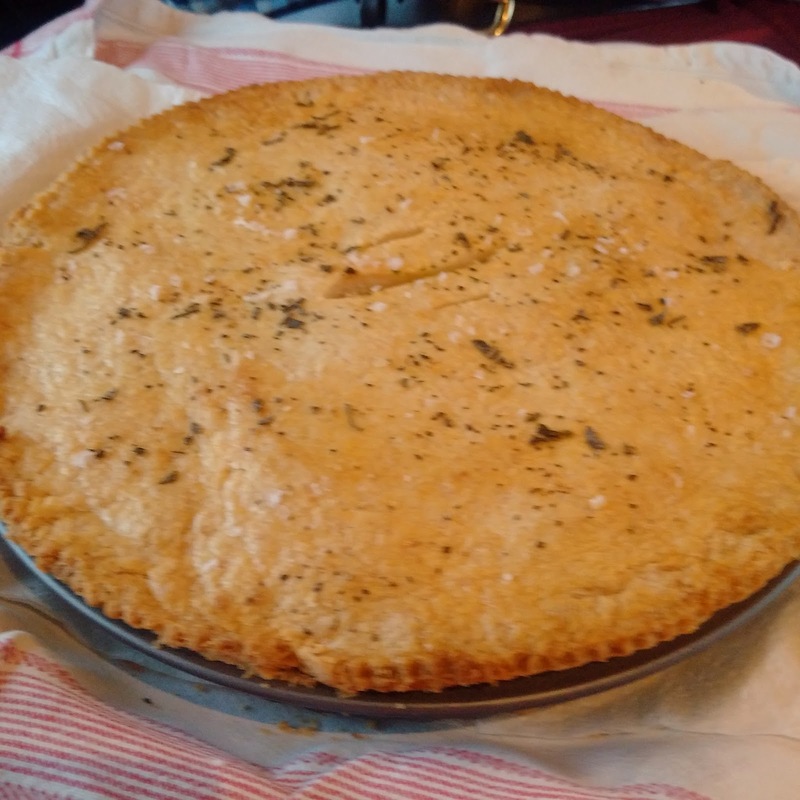 Brush the top of the pie with the egg wash then sprinkle on the chopped sage and a little flaky sea salt. Cut three short slits in the middle of the pie to allow the steam to escape. Return the pie to the oven and cook for 30-35 minutes, until the pie is golden brown all over. 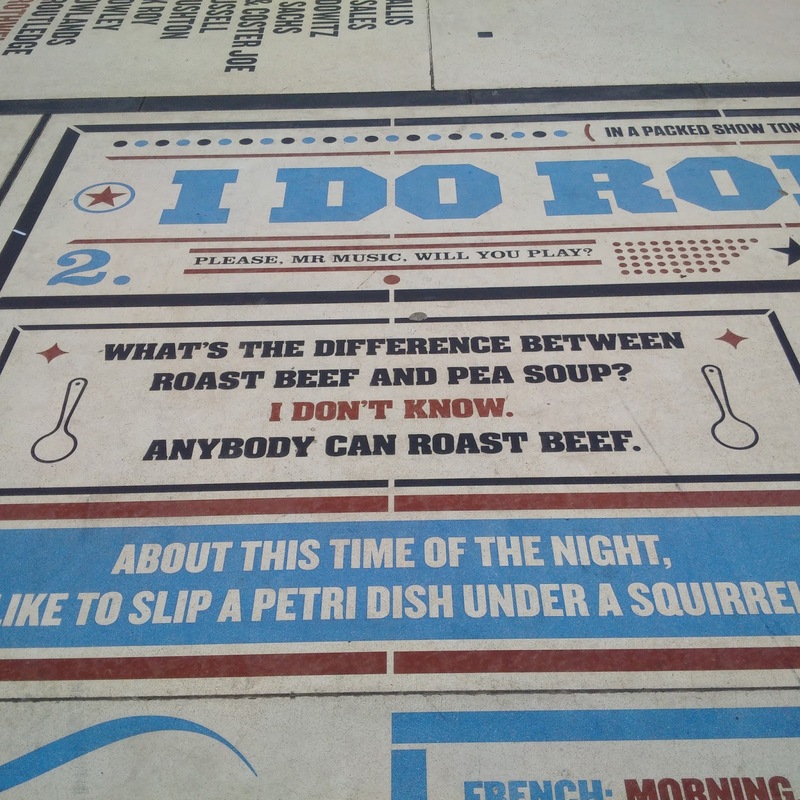 Serve warm or cold, with brown sauce if you like.